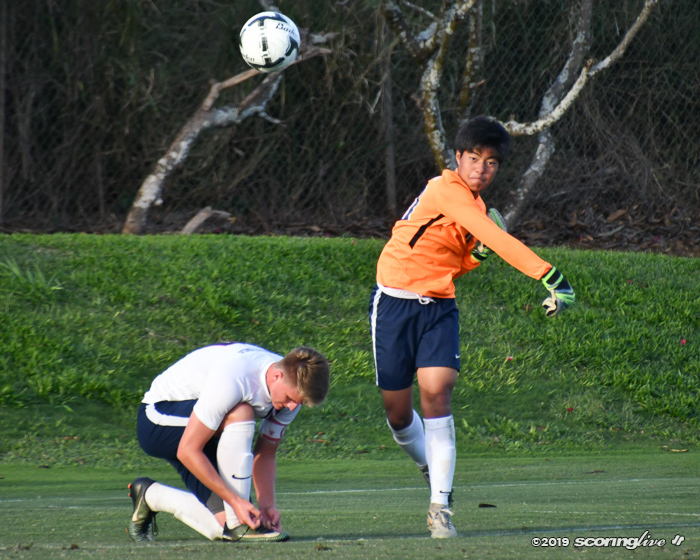 WAIPAHU — It's a story of redemption when it comes to the Kapaa Warriors boys soccer team. 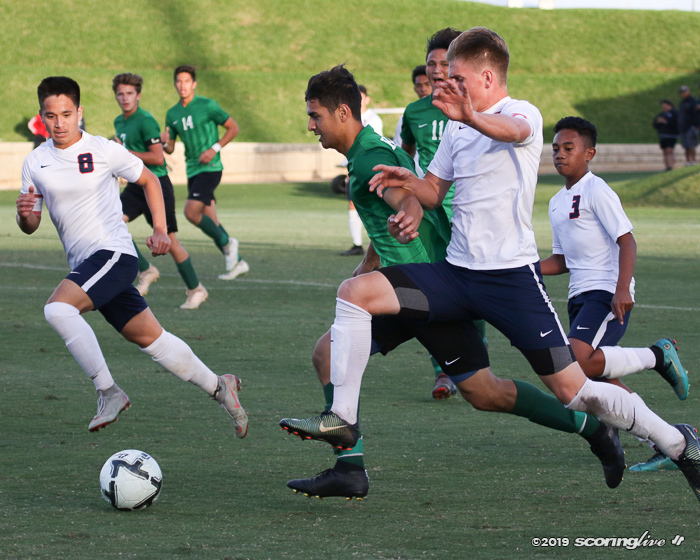 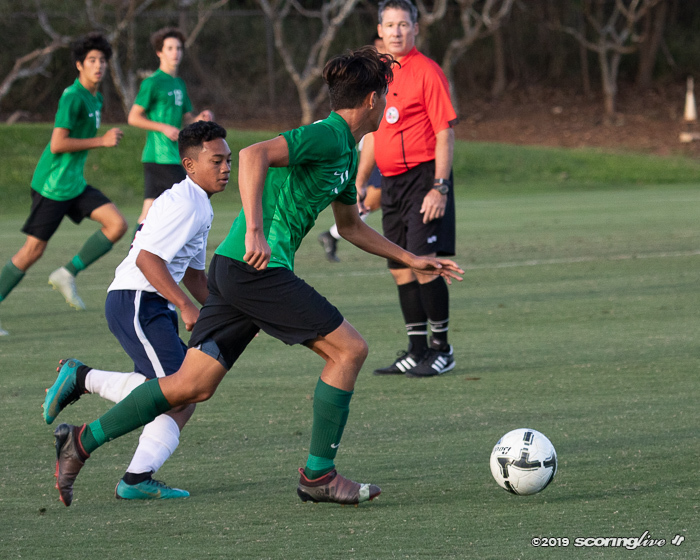 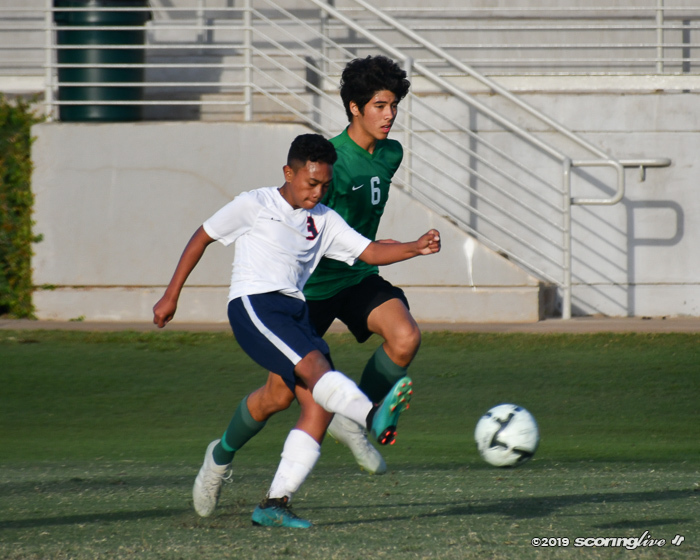 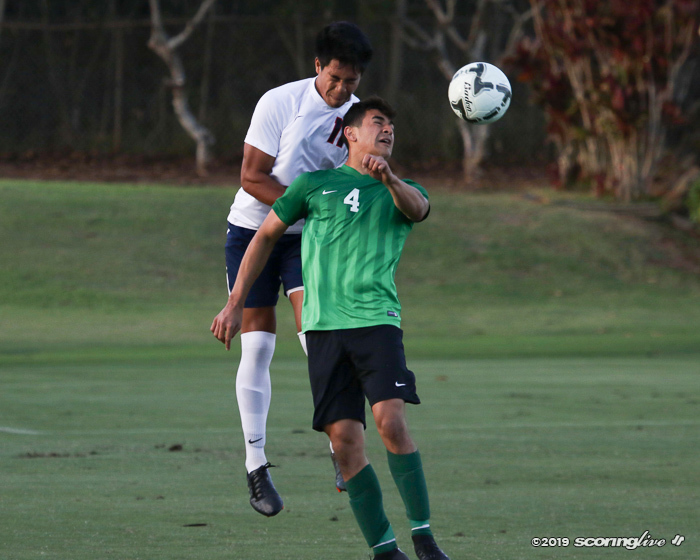 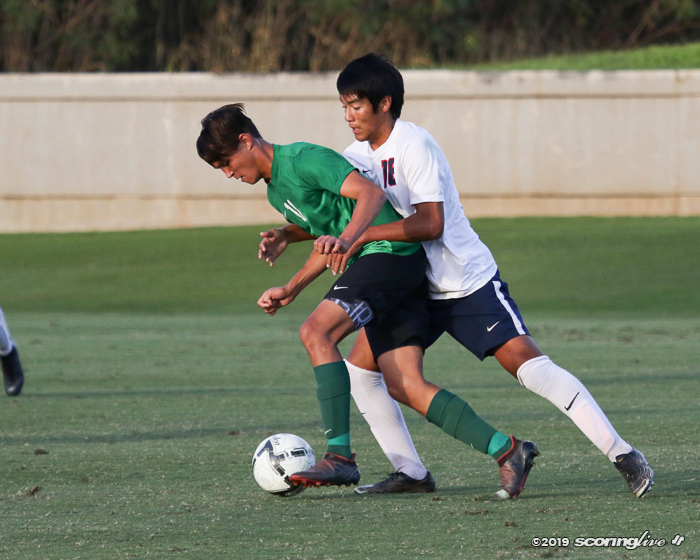 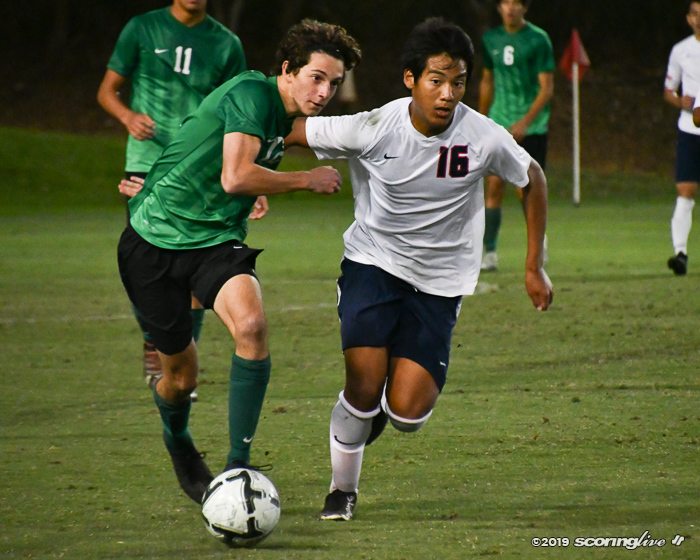 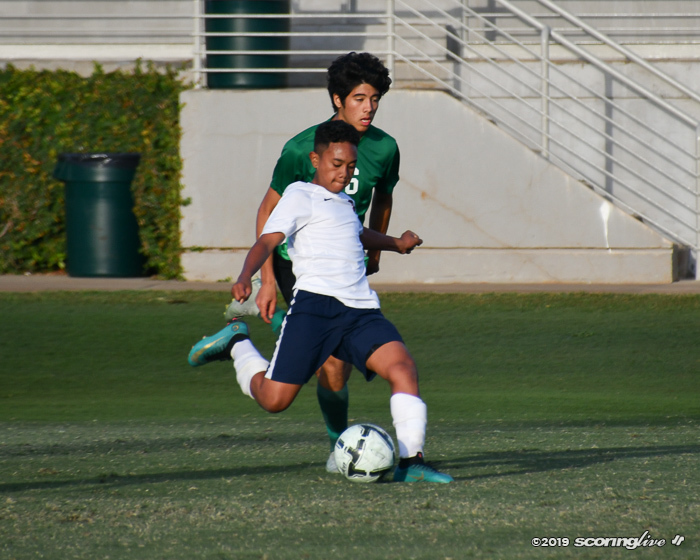 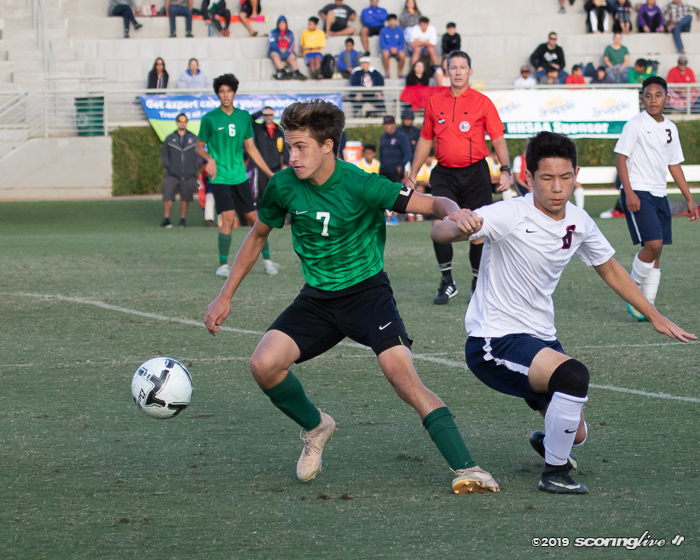 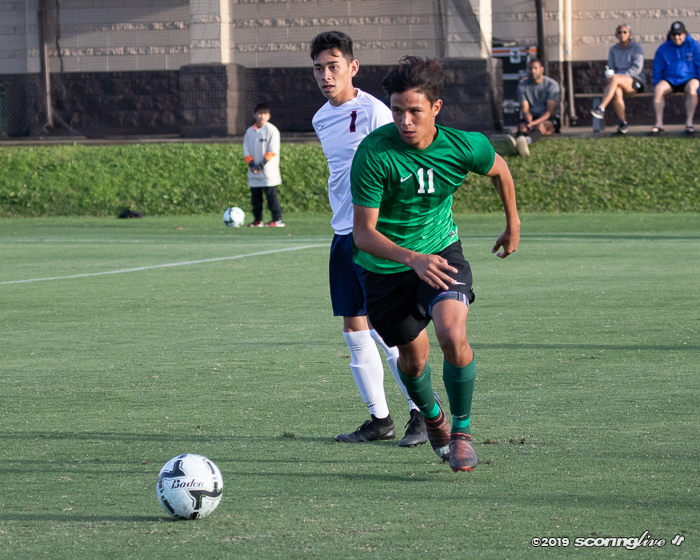 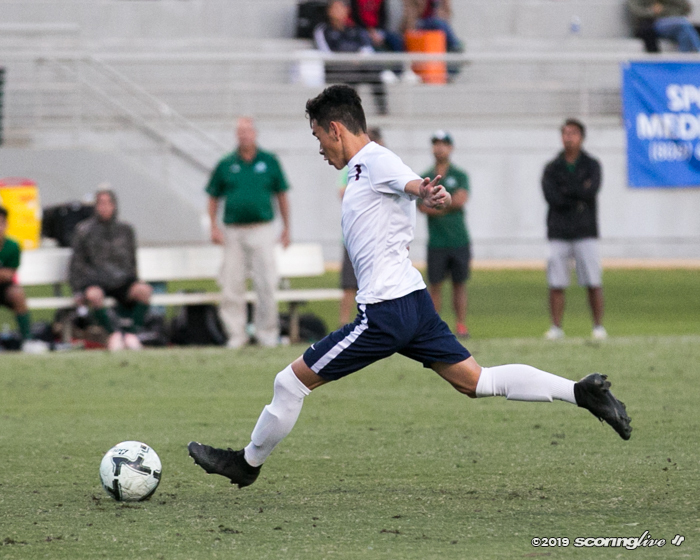 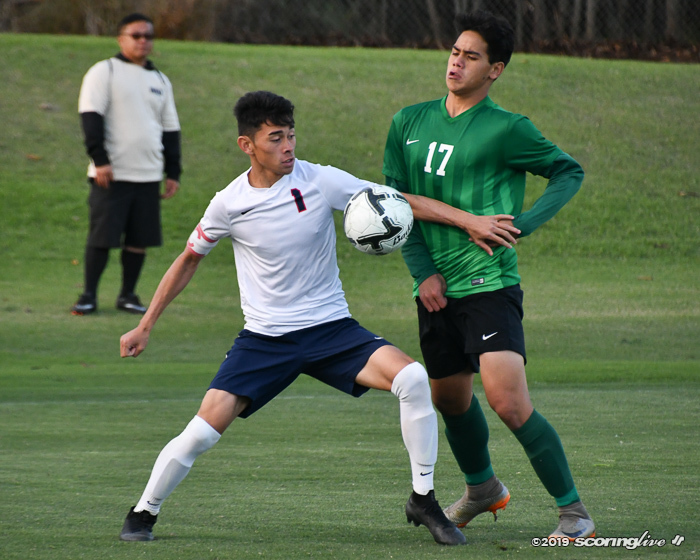 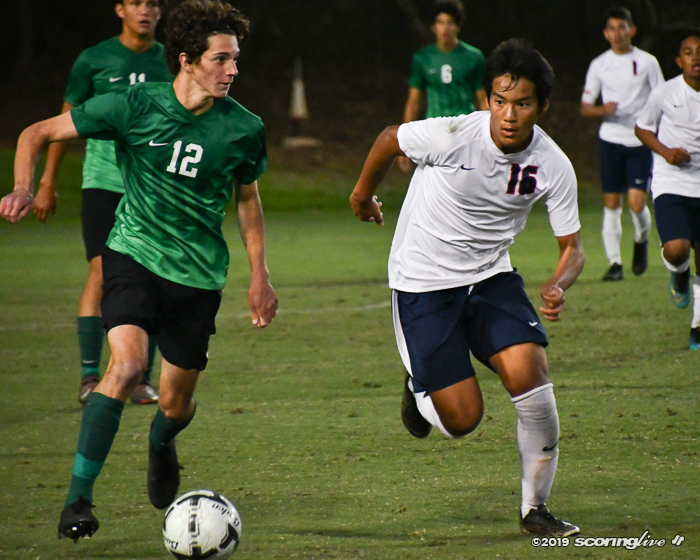 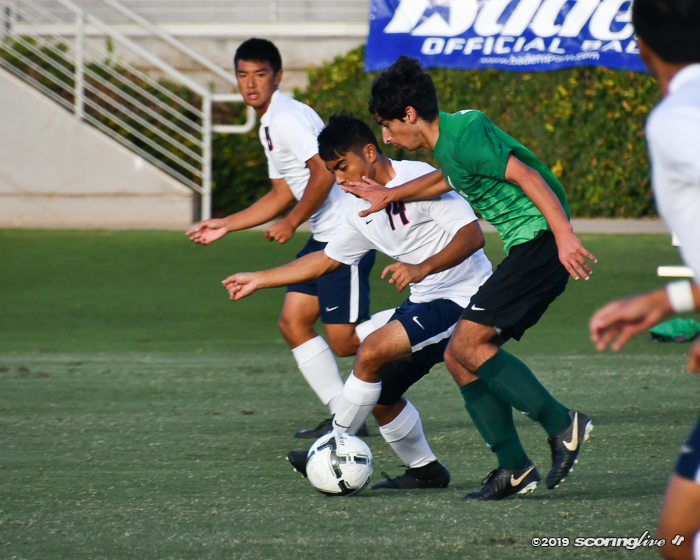 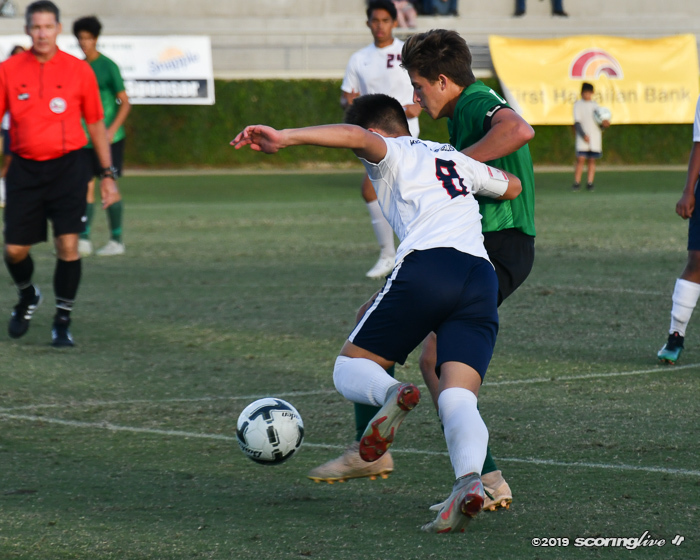 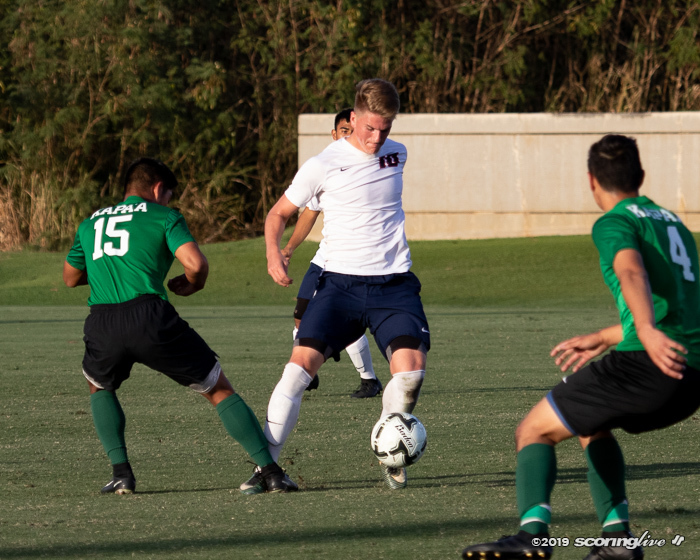 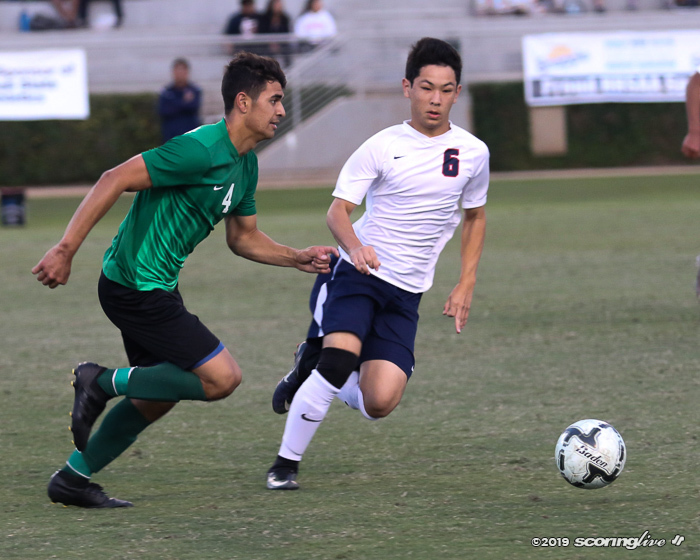 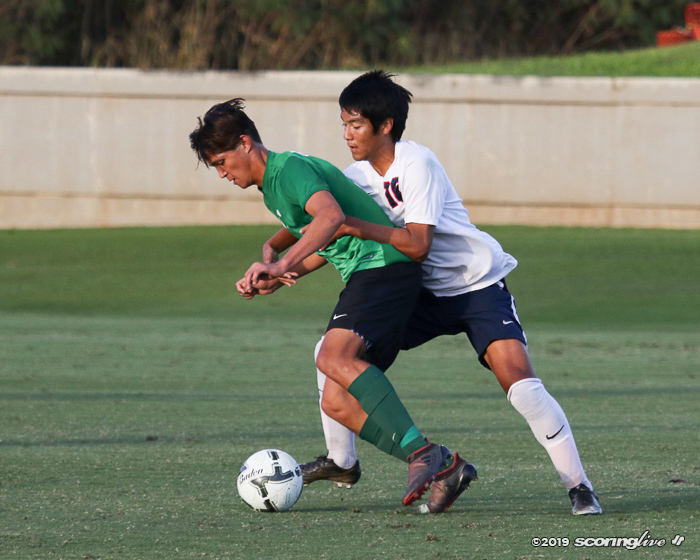 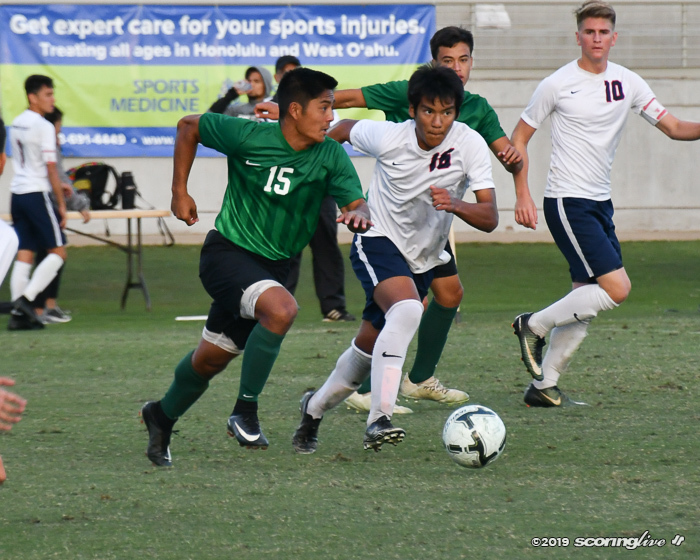 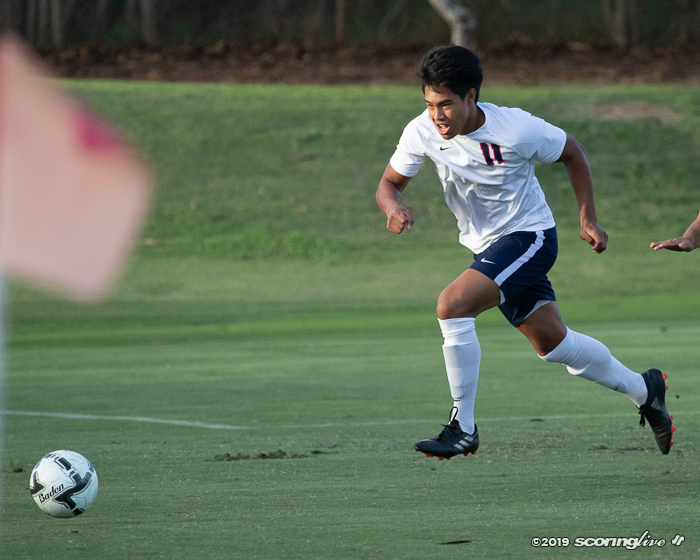 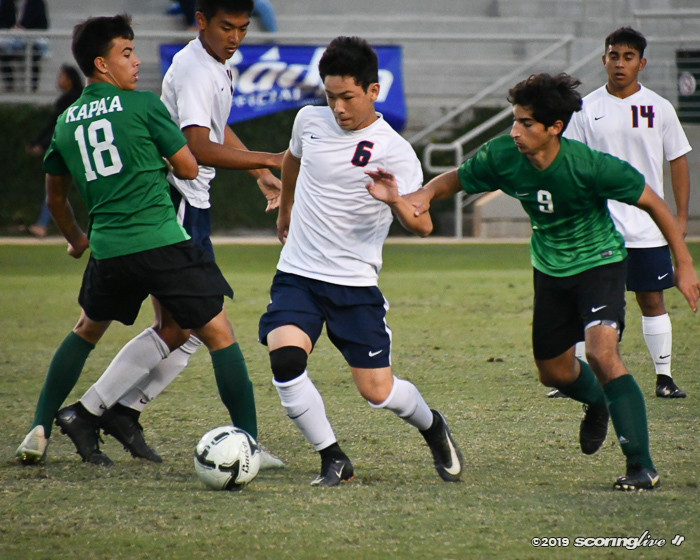 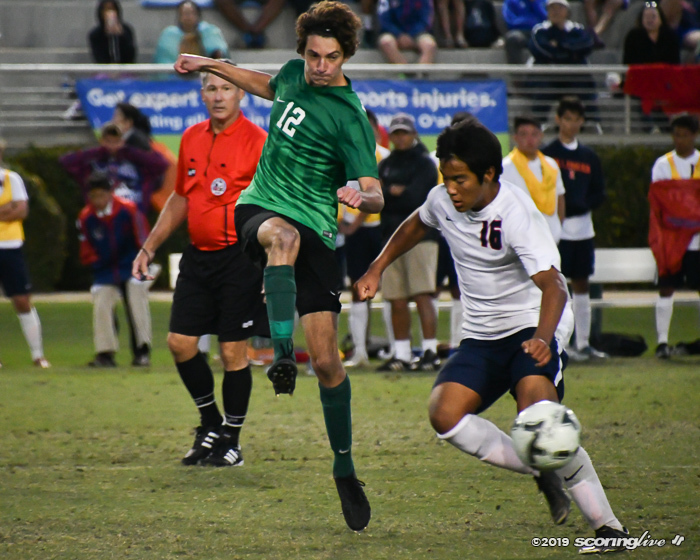 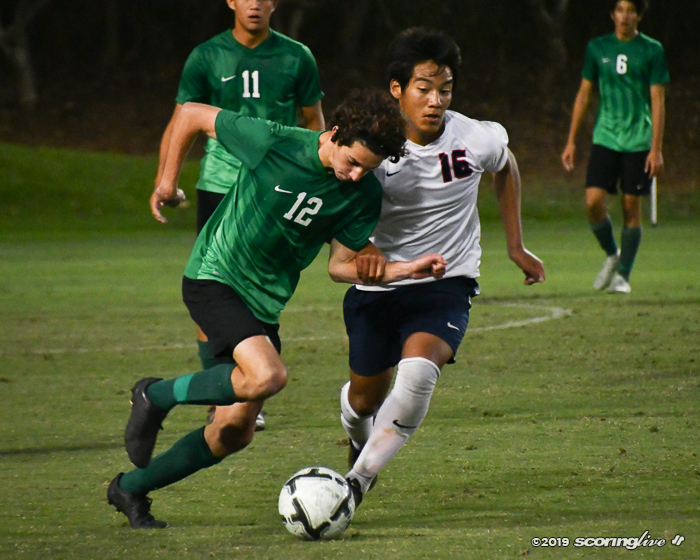 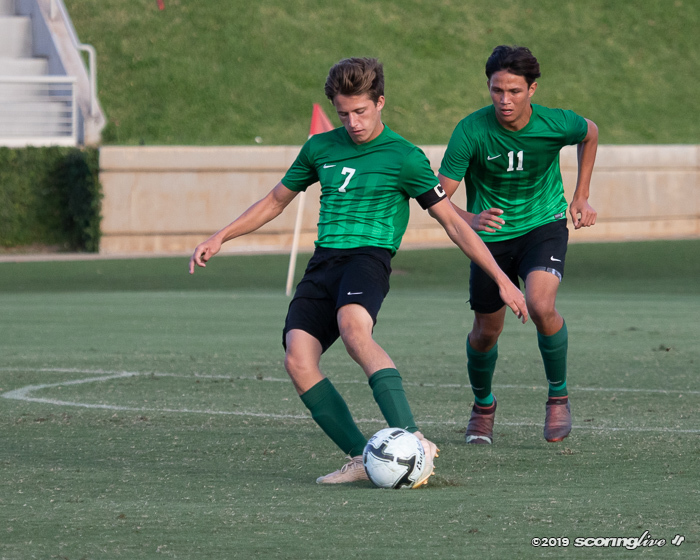 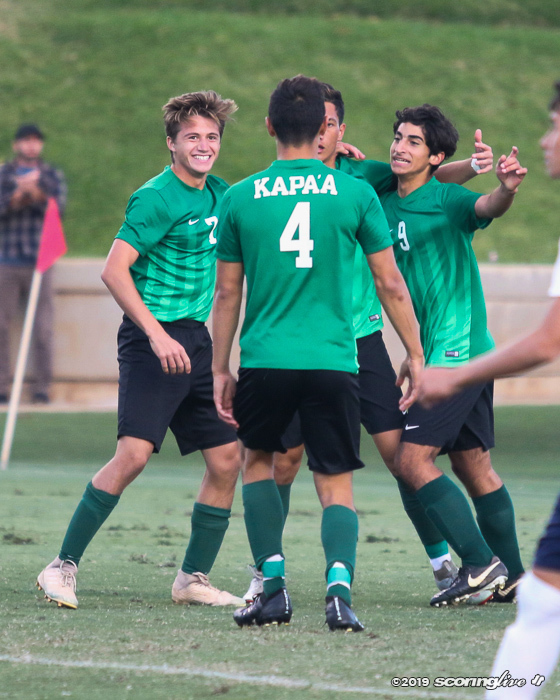 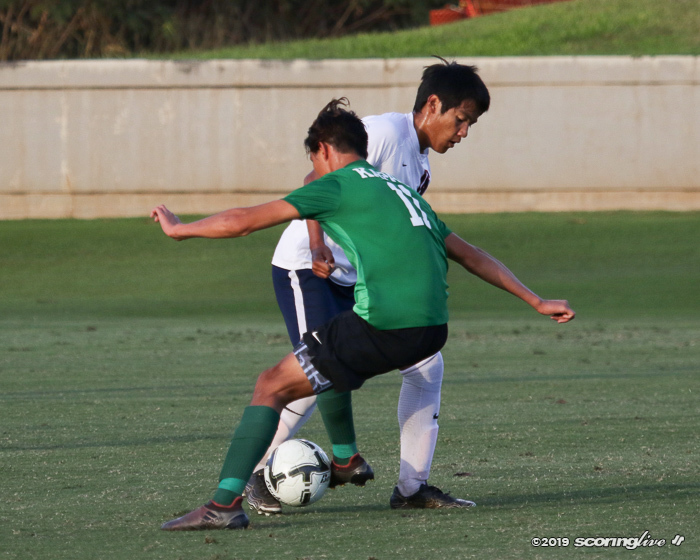 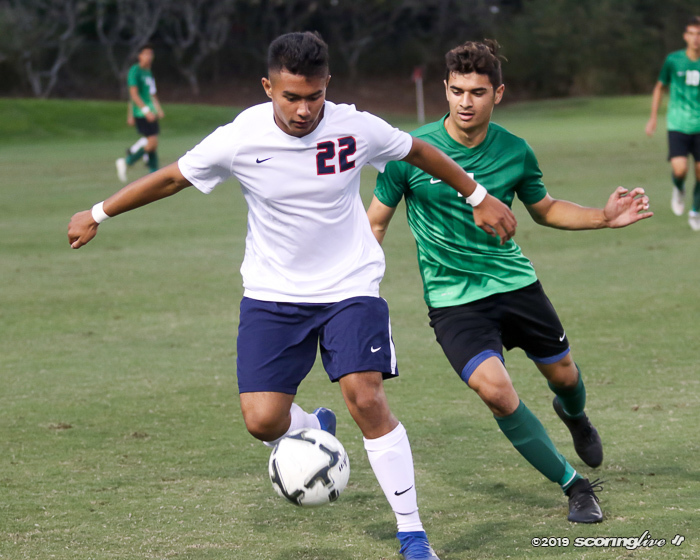 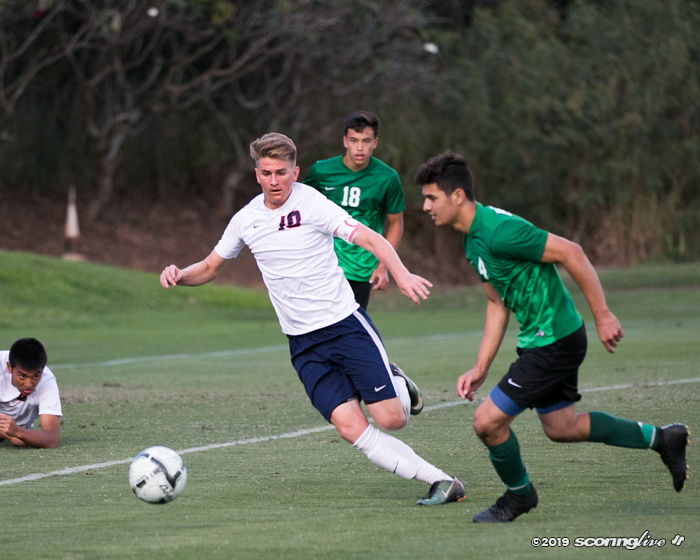 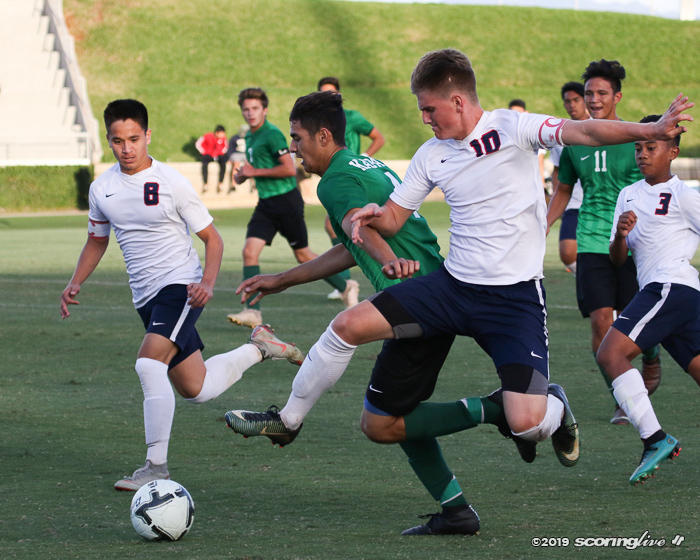 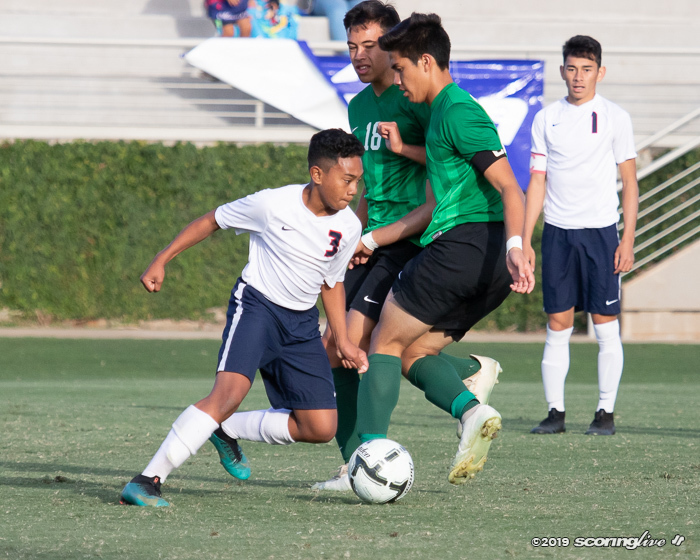 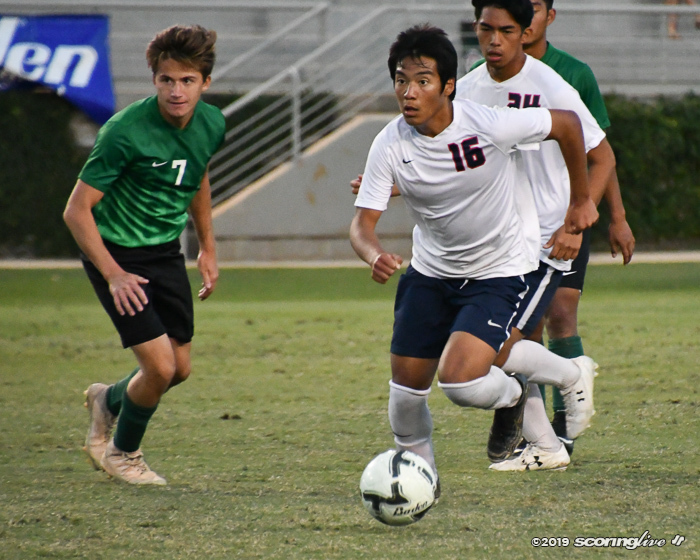 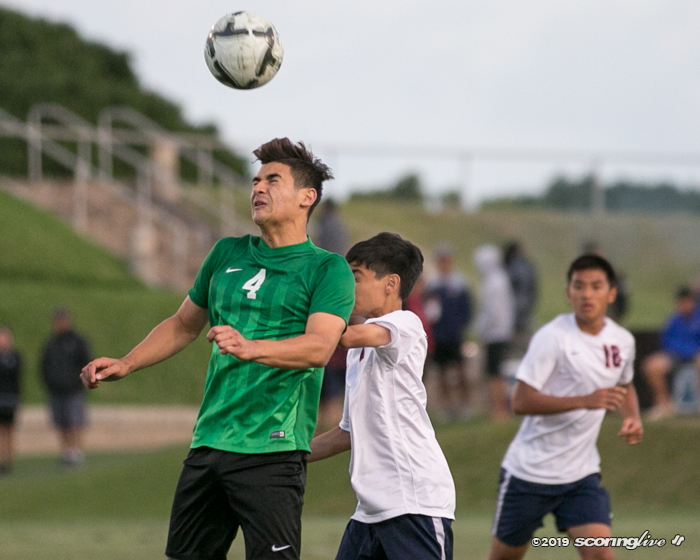 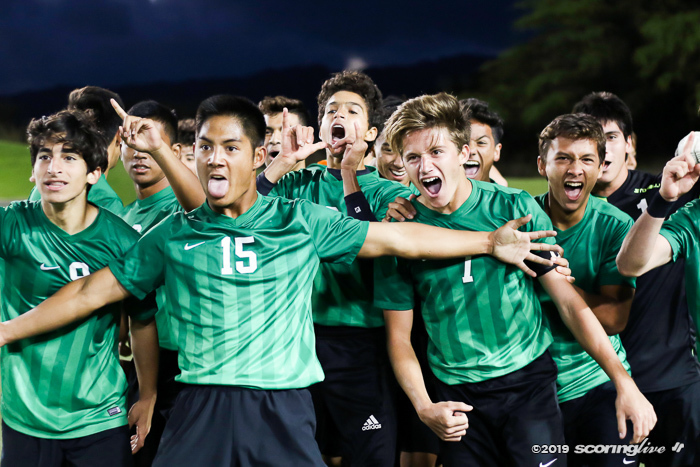 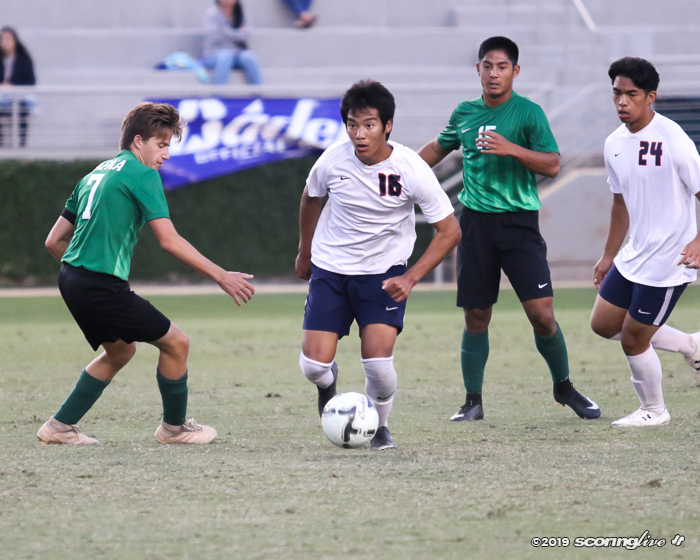 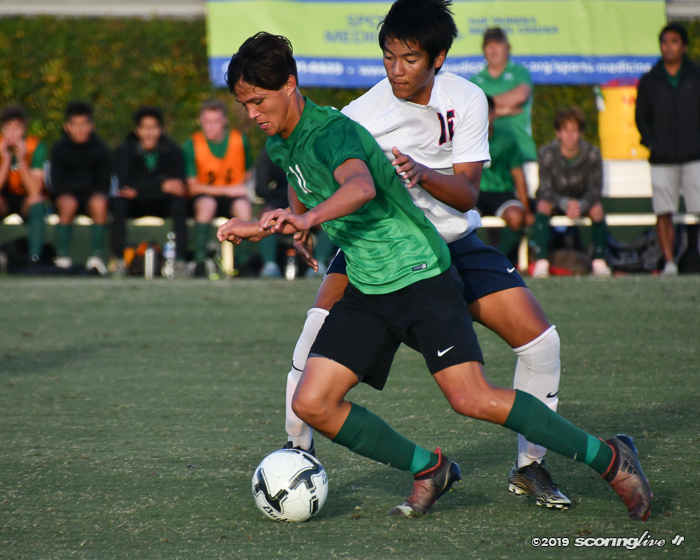 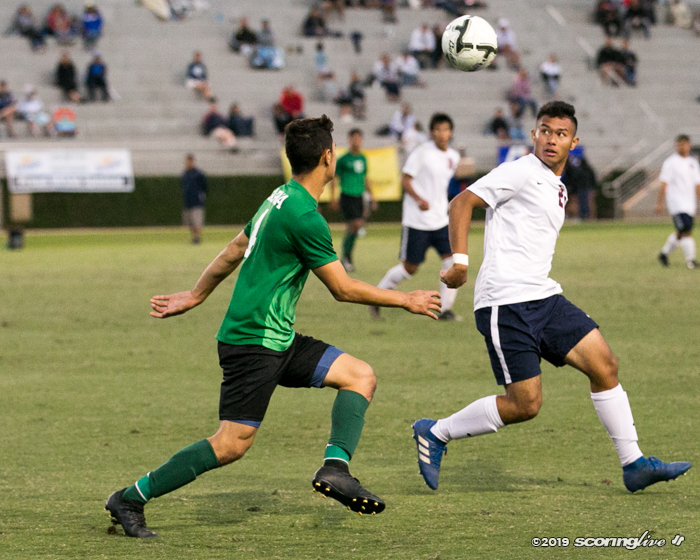 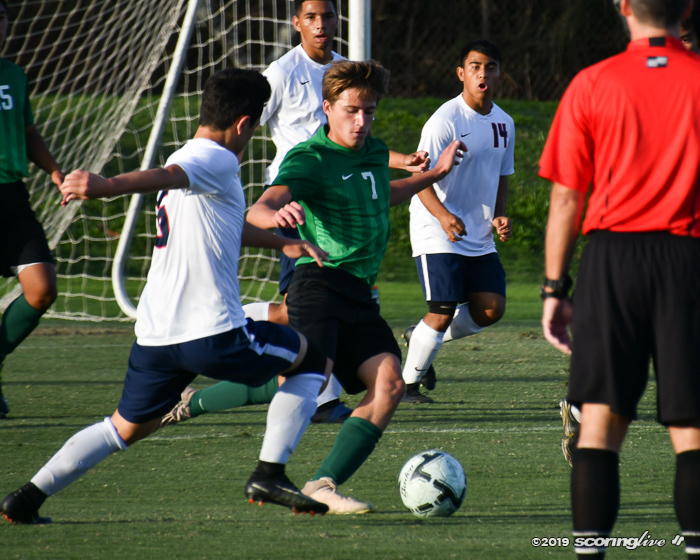 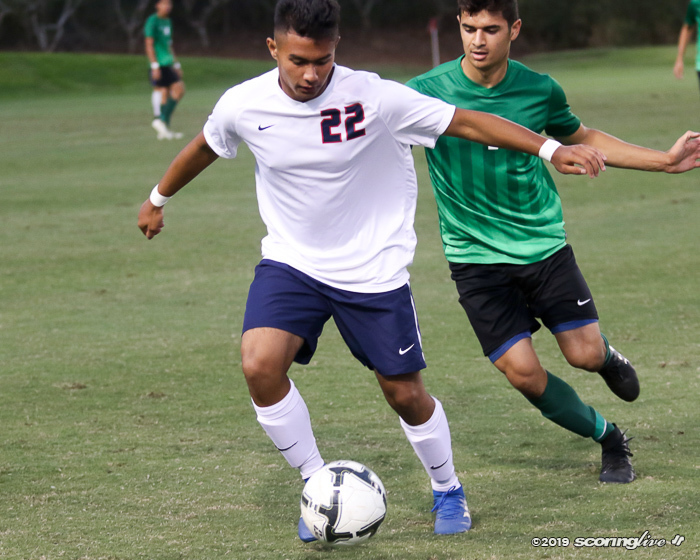 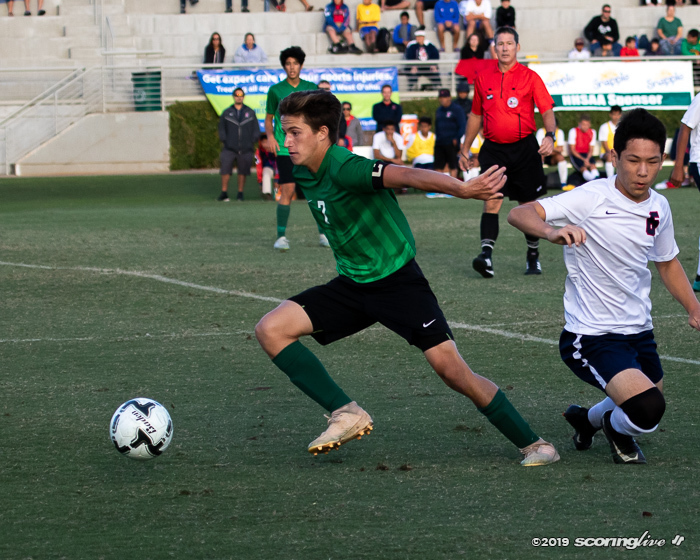 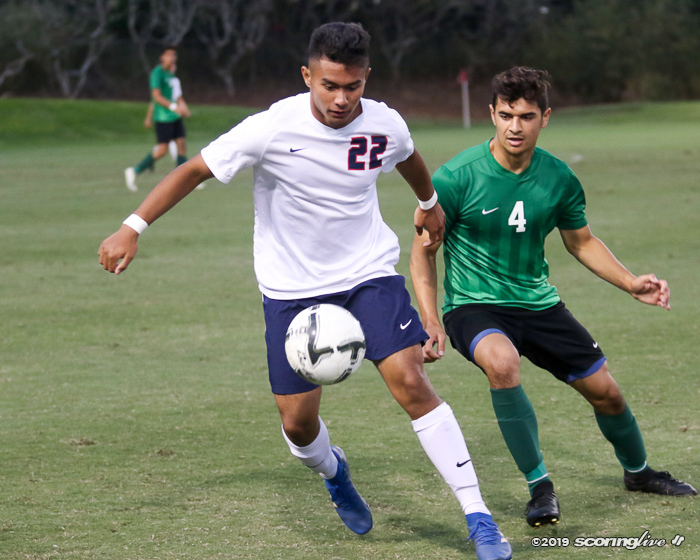 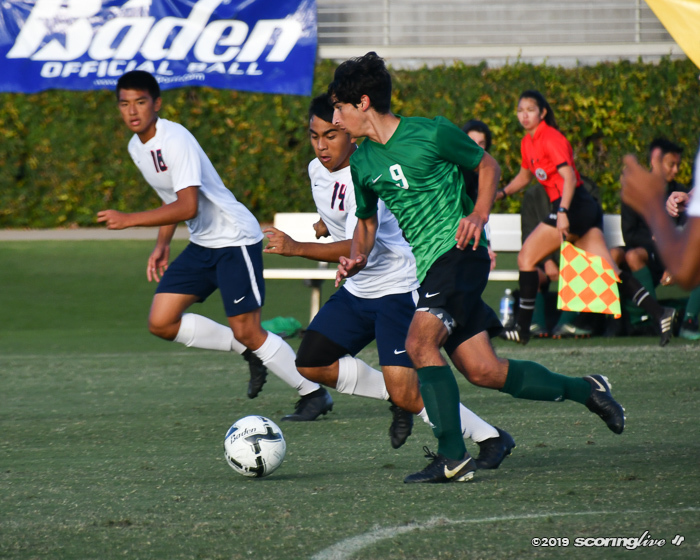 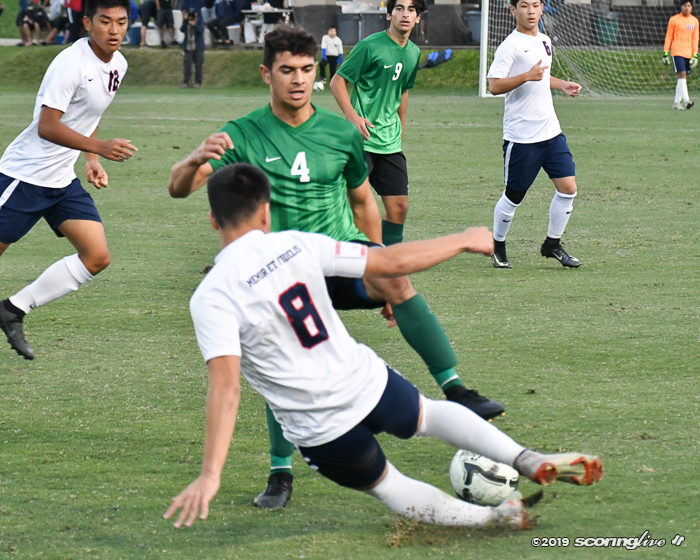 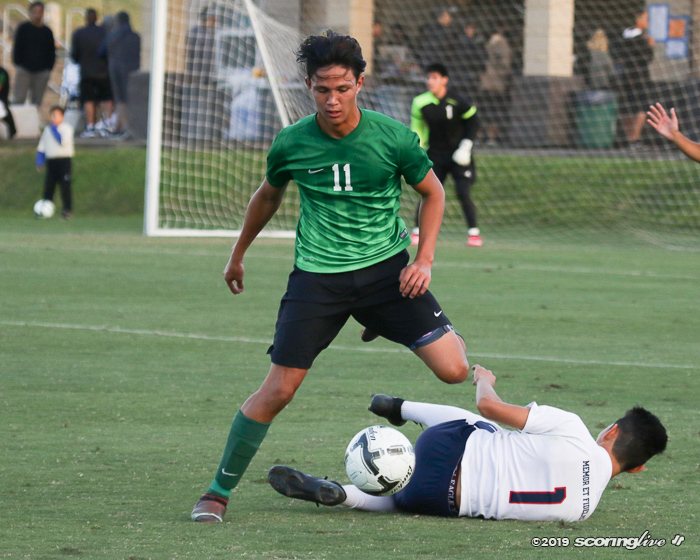 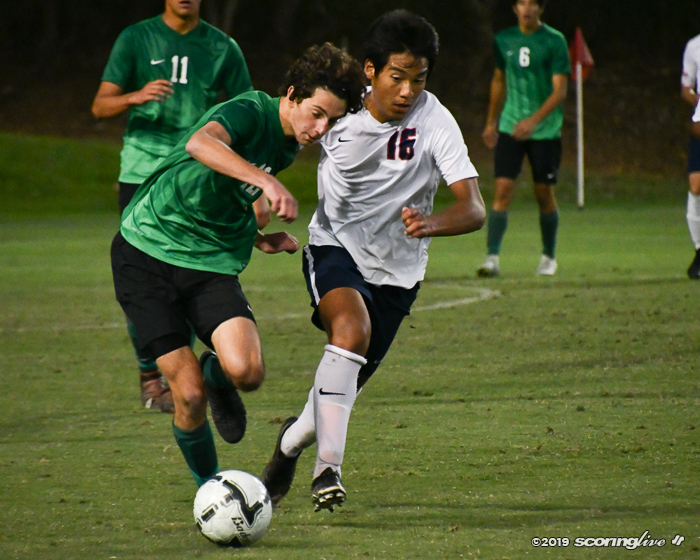 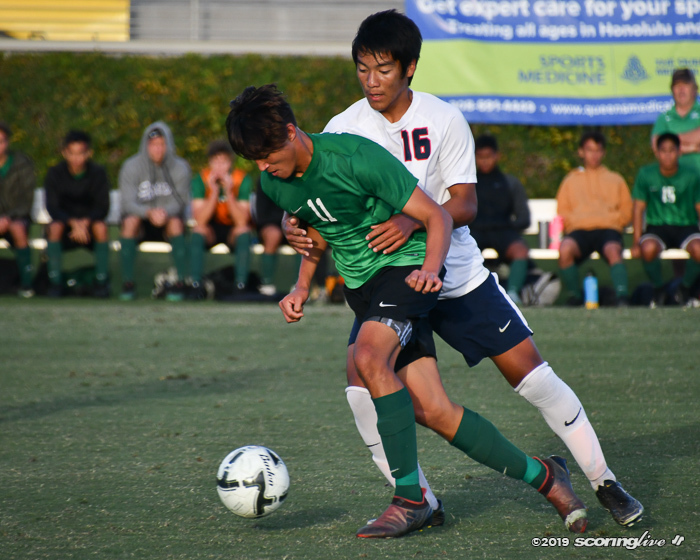 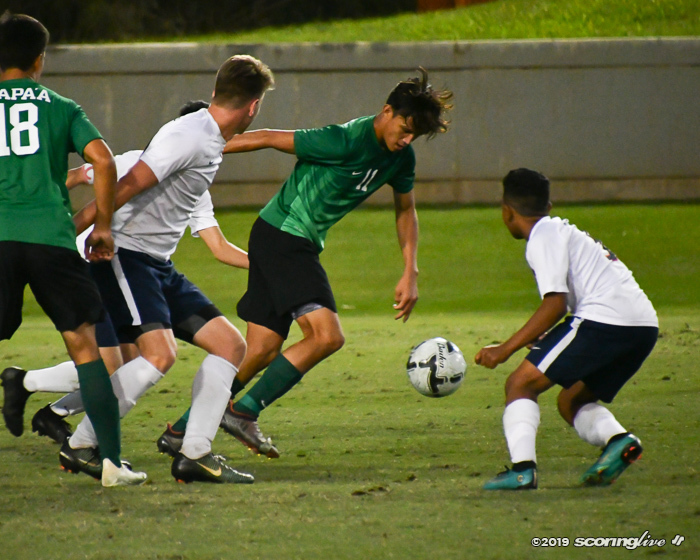 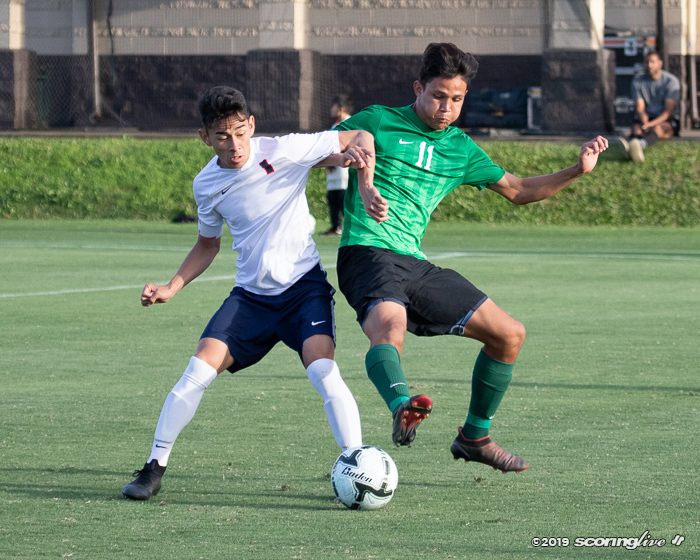 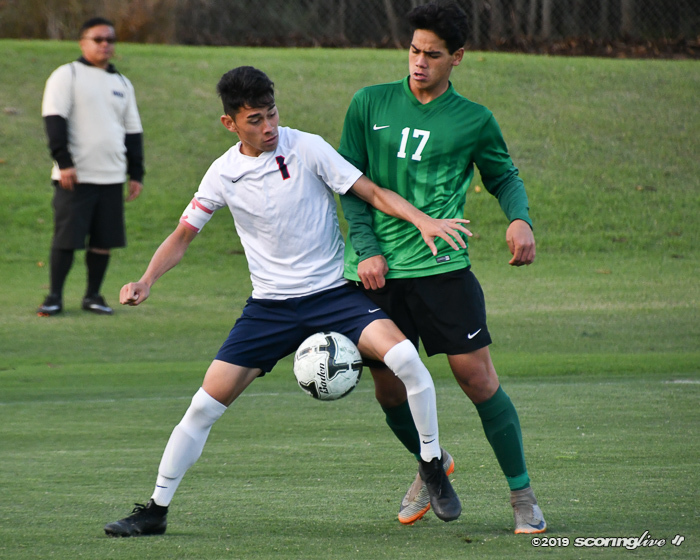 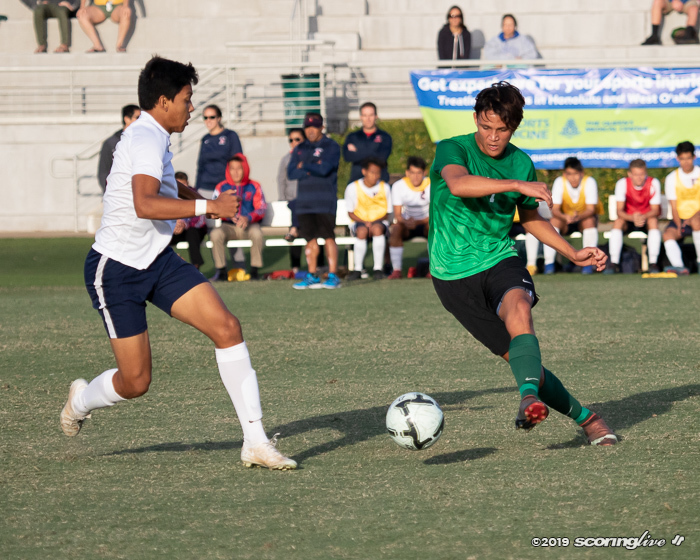 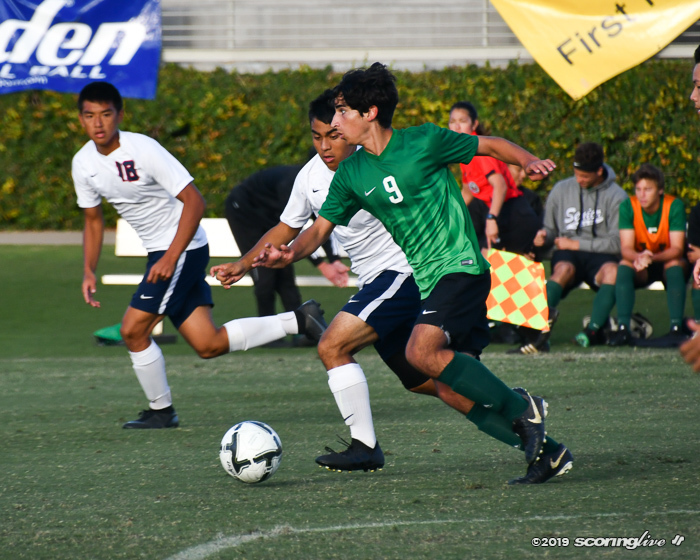 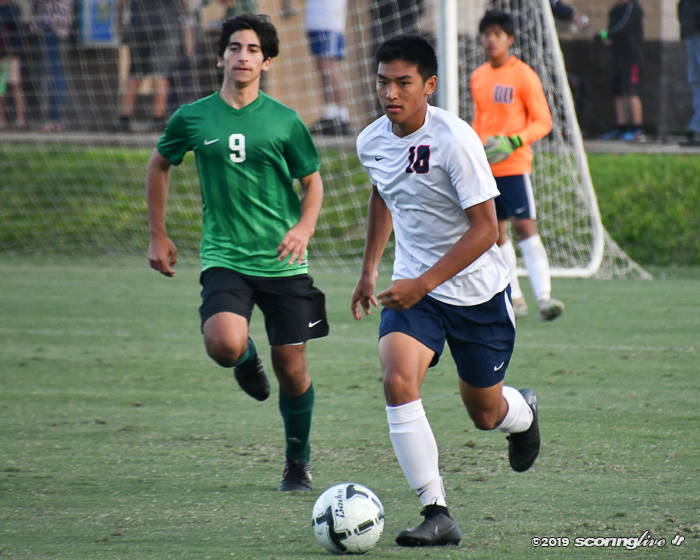 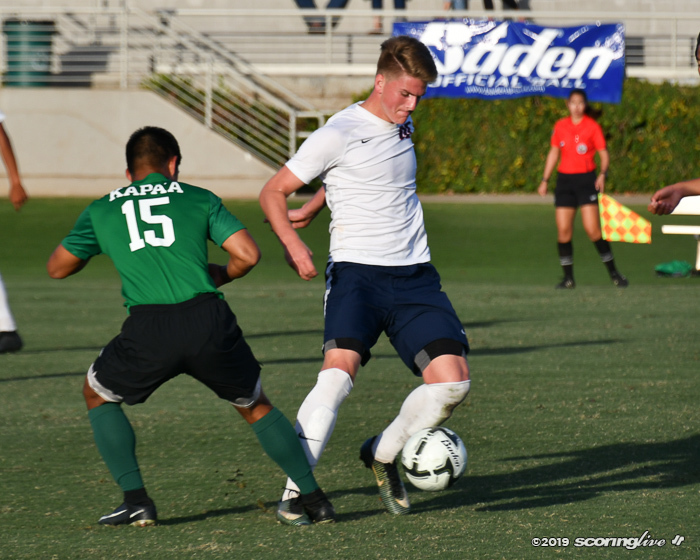 After coming up short last year against Kamehameha-Hawaii, the Warriors put together a solid performance Saturday night to defeat Saint Louis 1-0 at the Waipio Peninsula Soccer Stadium in the Queen's Medical Center Division II Boys Soccer Championships. 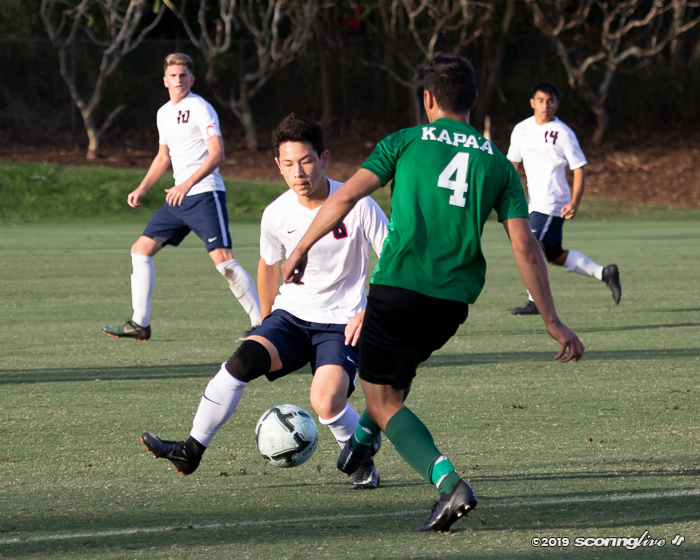 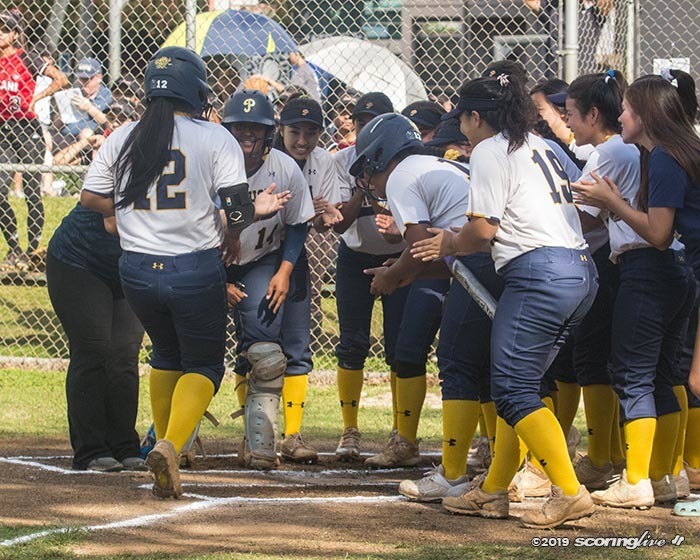 "We came up a little short last year but made up for it this year," said Kapaa coach Kevin Cram. 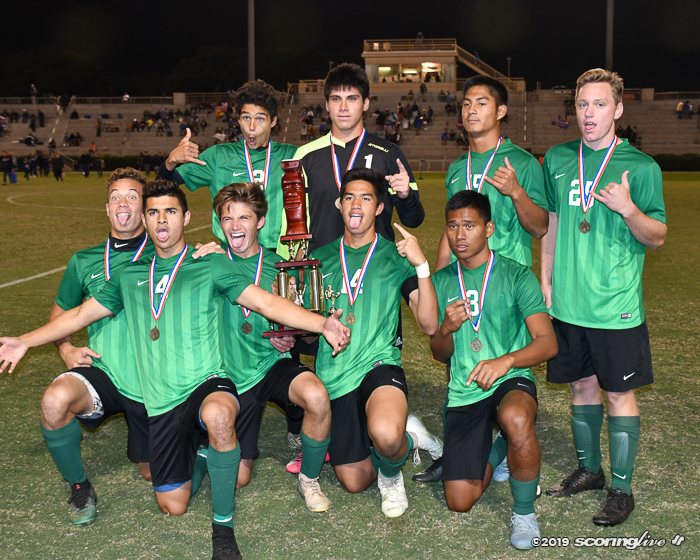 "We knew we had the boys that could at least compete and be competitive this year, but winning the trophy was our desire." 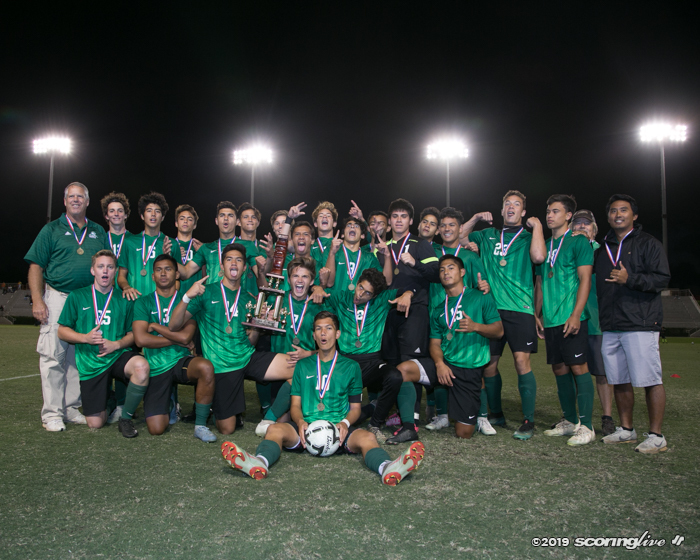 It was the Warriors' third state title in school history and their first since 2013. 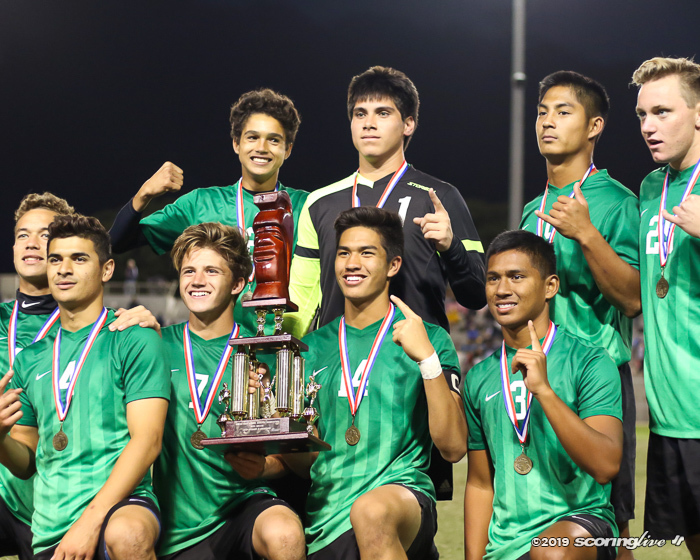 "It's been a long time coming," said senior captain Kiran Costa. 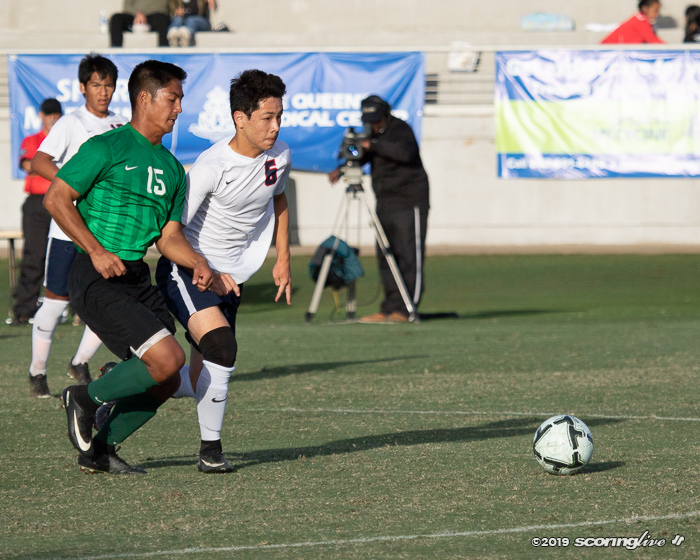 "It was a great experience. 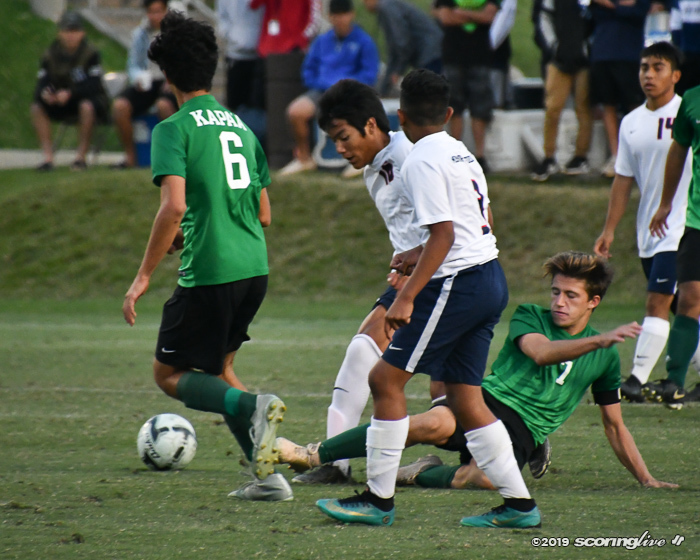 We were on our toes the whole time and we knew that they (Saint Louis) were going to come in hard. 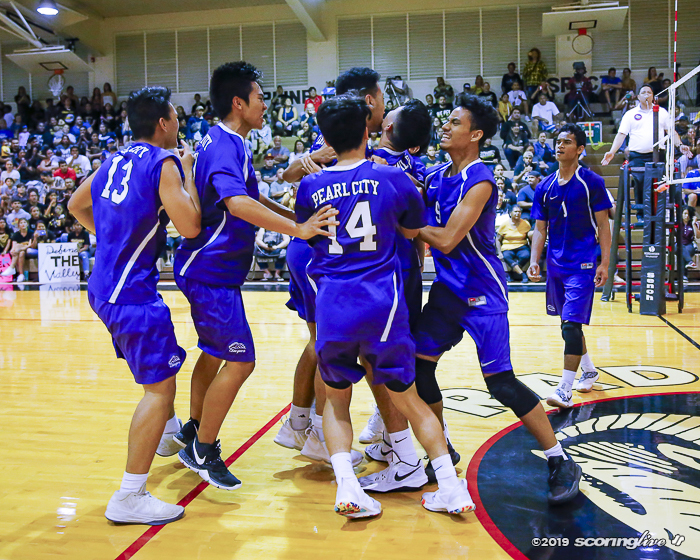 They played in the ILH and they did very well in their league. 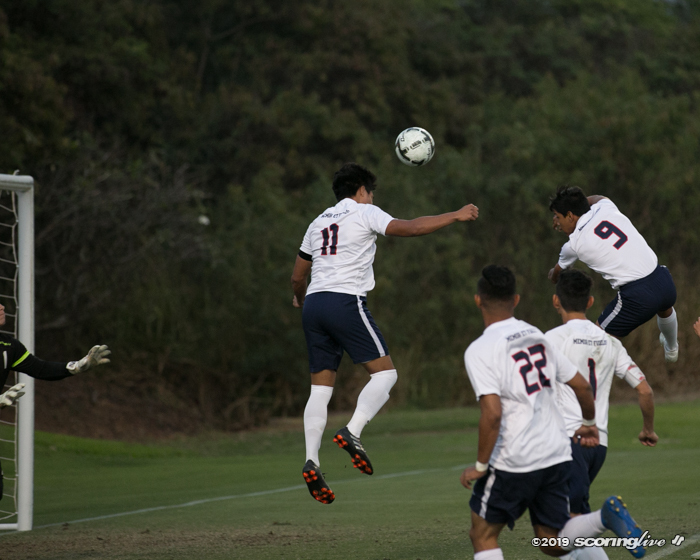 We knew that we had to be on our game and give them no opportunities. 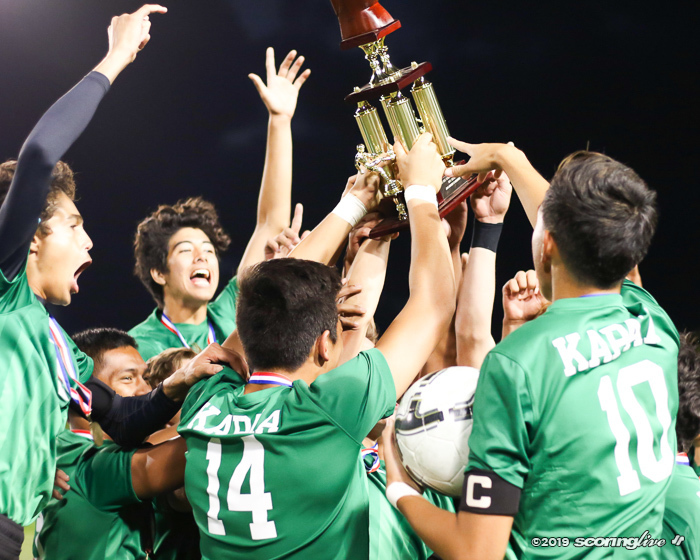 They did have a couple chances but we cleaned it up." 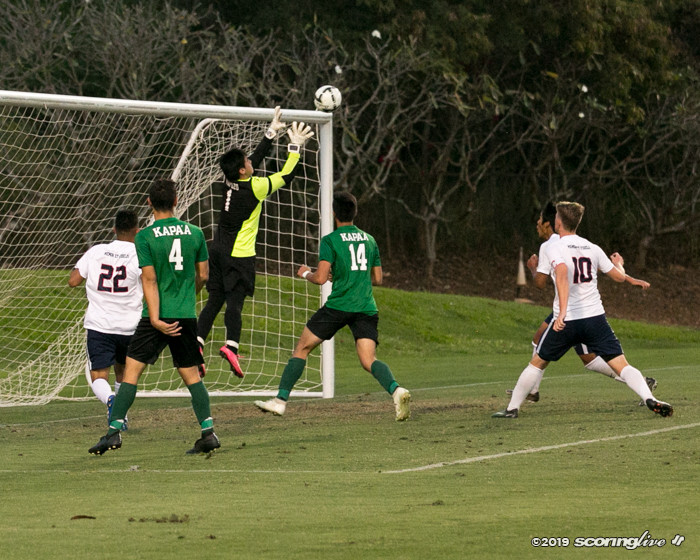 The game winning goal came in the 51st minute of play. 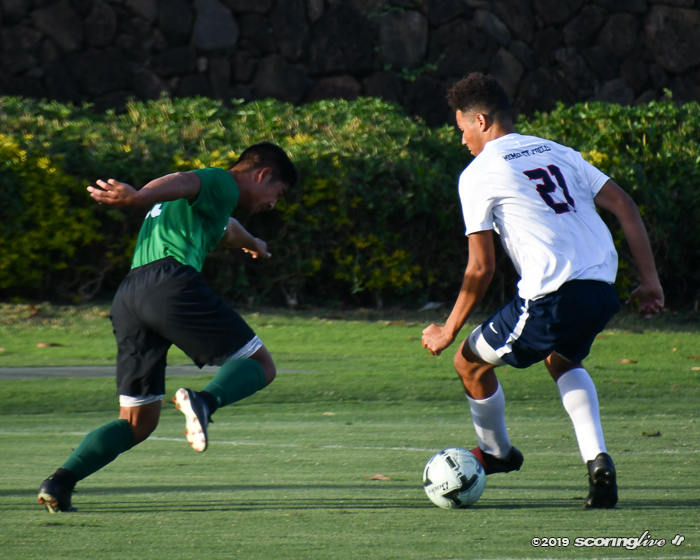 A Crusaders defender tried to clear the ball from the box, but it hit the arm of another defender and Kapaa was awarded a penalty kick. 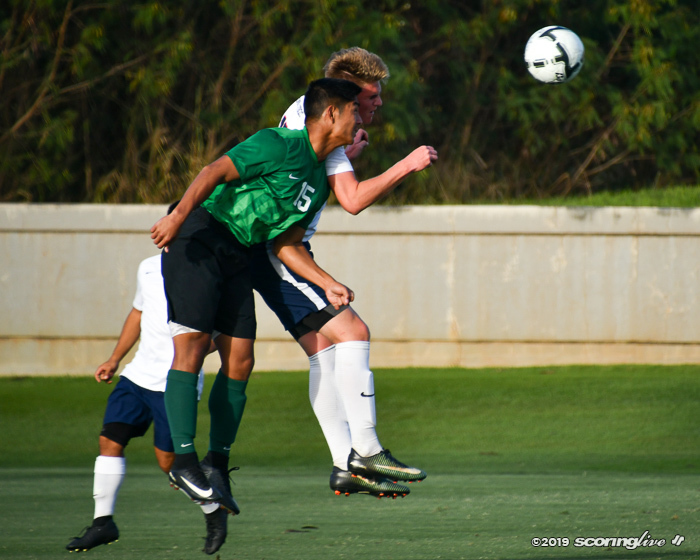 Junior midfielder Laa Gonsalves stepped up and confidently placed his shot into the bottom left corner of goal. 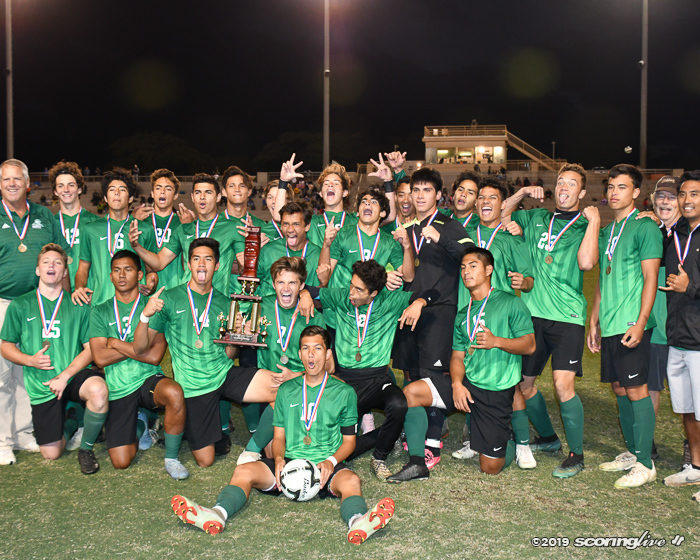 "It was like a fairytale," Gonsalves said. 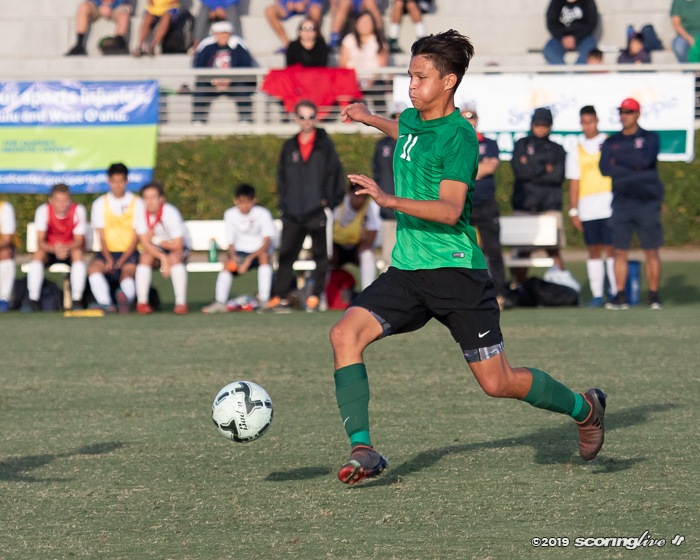 "I was really stoked because I knew what I could do for my team and put them ahead. 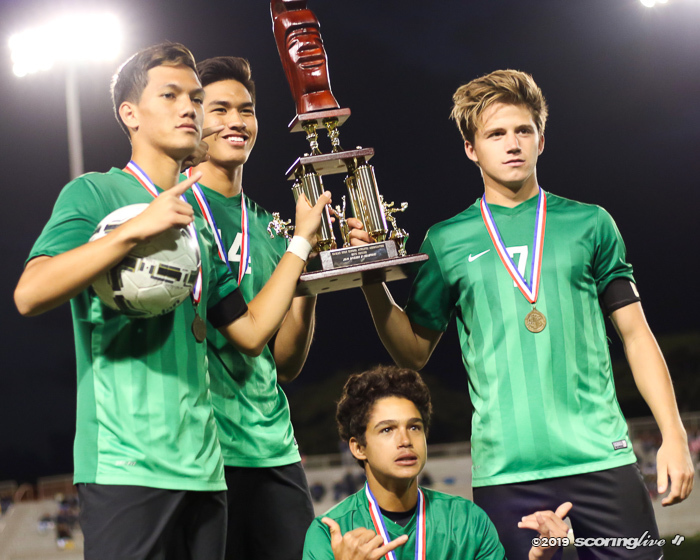 I wanted to win this one for all the seniors. 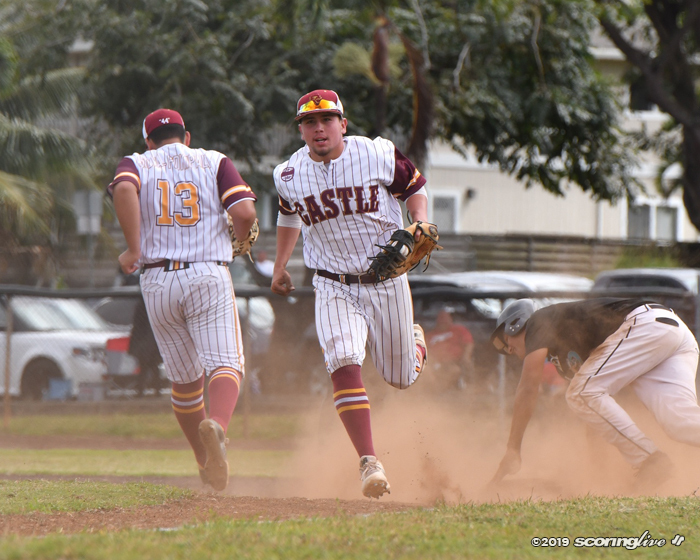 Last year's loss kept us motivated." 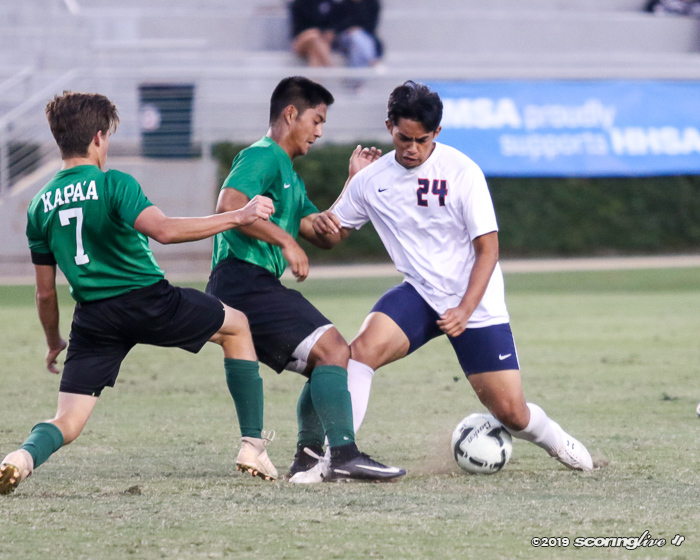 Besides the penalty kick, the match was a defensive battle from the very beginning. 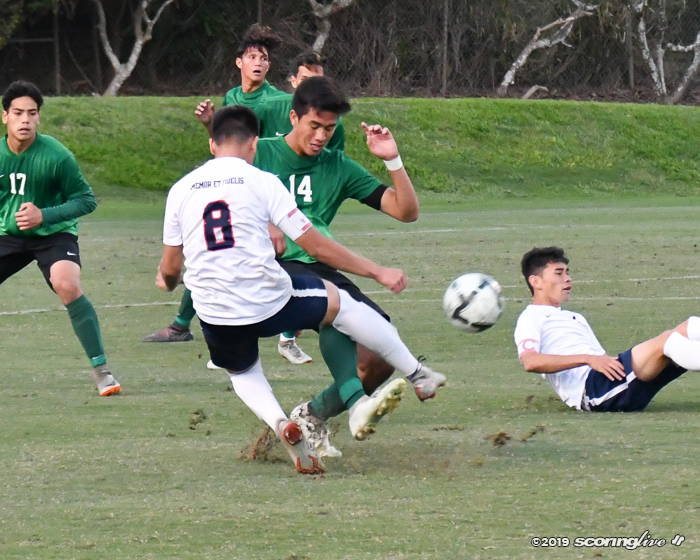 Both teams managed to keep each other from getting any clean chances on goal. 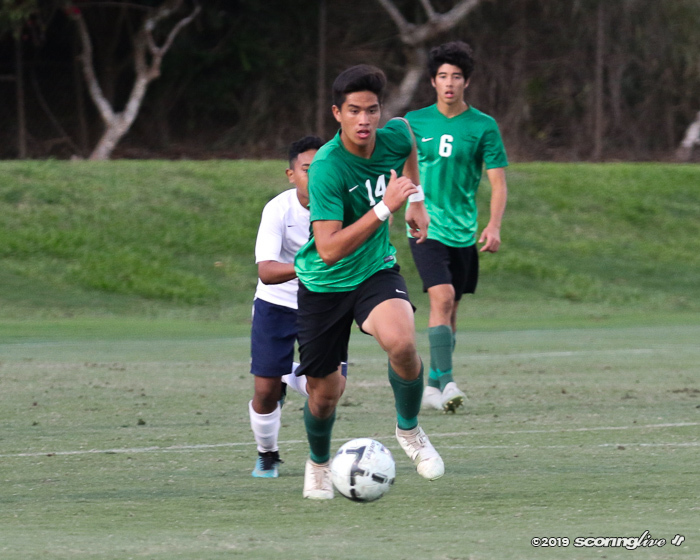 The Warriors backline had the tough task of corralling Saint Louis forward Skyler Goo. 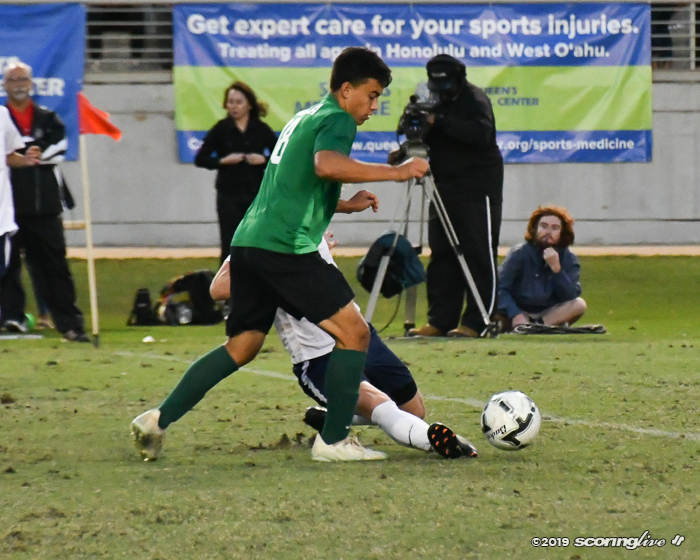 Goo has a total of 23 goals on the season but the Warriors kept him quiet for most of the night. 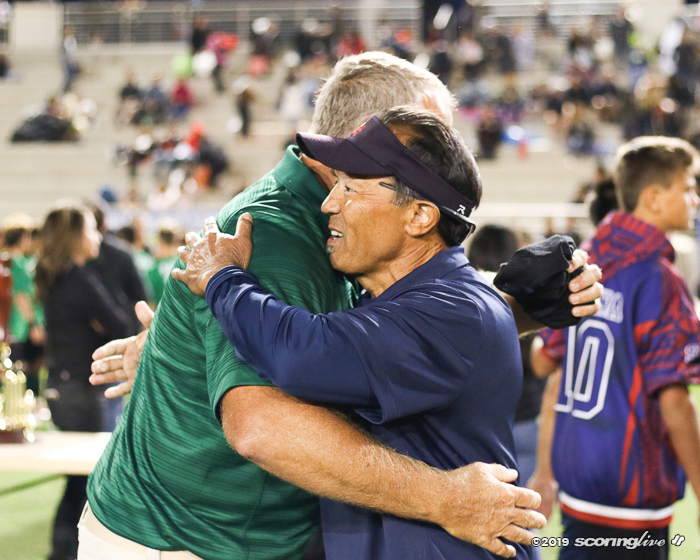 "We basically tried to shut him down," Cram said of Goo. 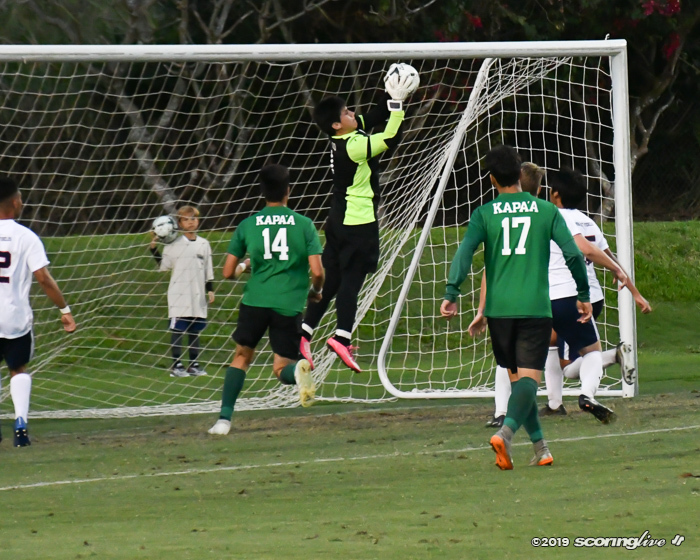 "Watching their match yesterday, he was their go to guy and our feeling was if we could prevent him from putting the ball in the net, we could win the match or at least take it into penalties." 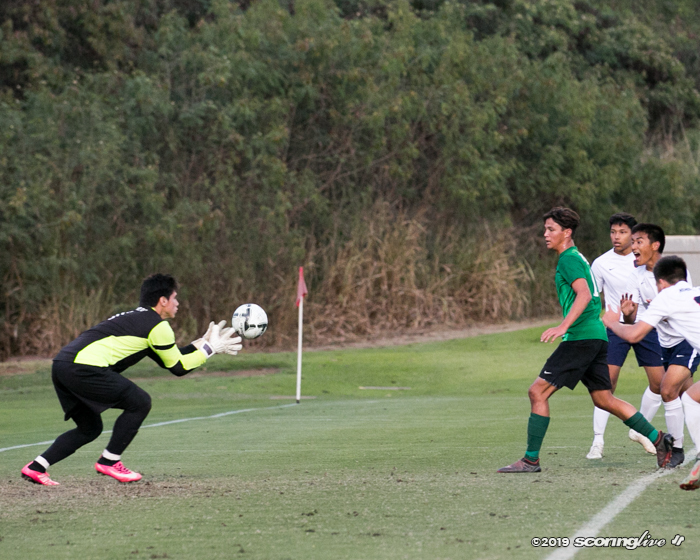 Cram credited switching formations from a 4-4-2 to a 2-3-3-2 to help his team keep the clean sheet. 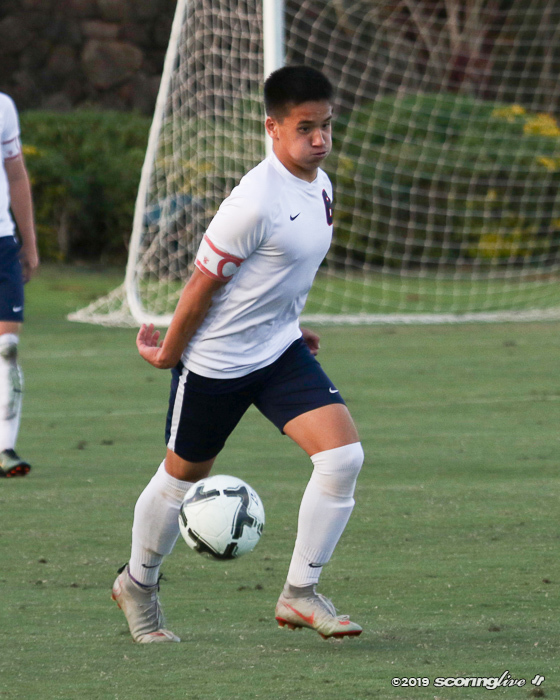 Costa is a starting center back and was one of the key members who prevented Goo and the Crusaders offense from getting on track. 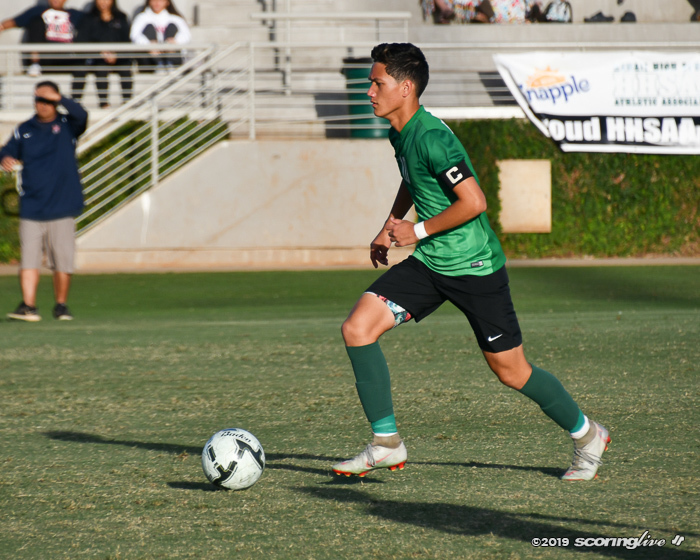 "He (Goo) was unbelievable," Costa said. 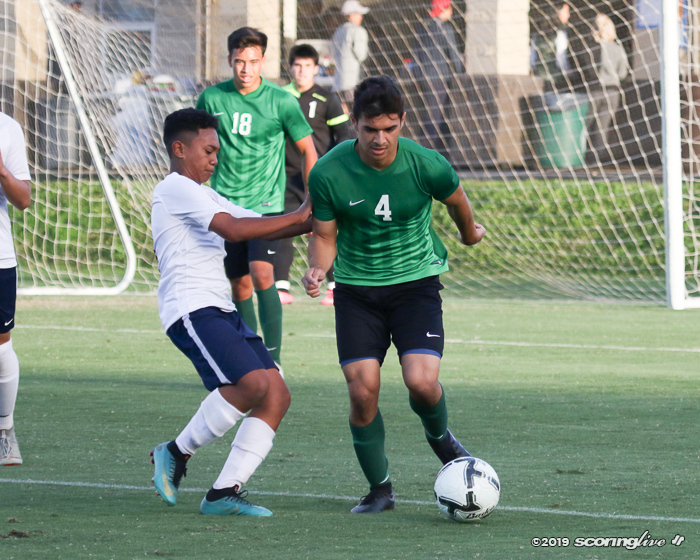 "Our strategy coming in was put two (defenders) on him. 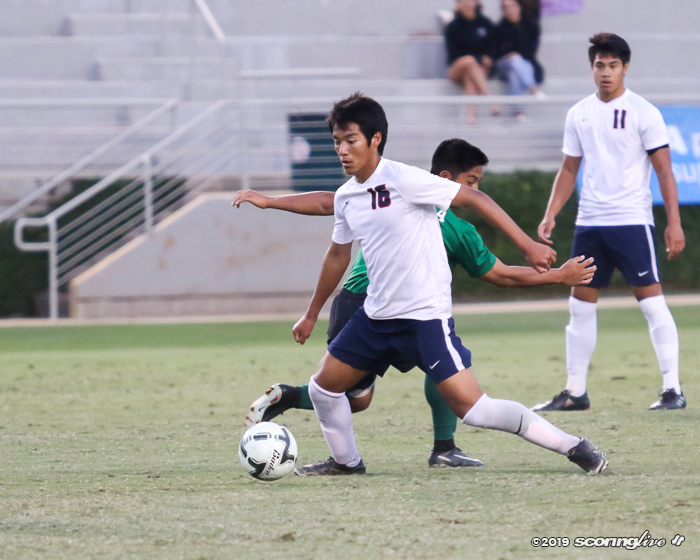 We couldn't let him get anywhere because if he did, he's very dangerous and very fast." 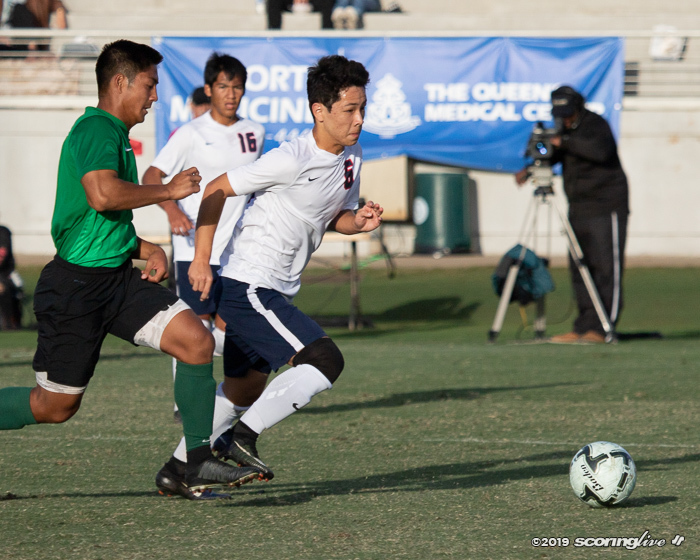 This was the second Division II title match for Saint Louis in the last three years. 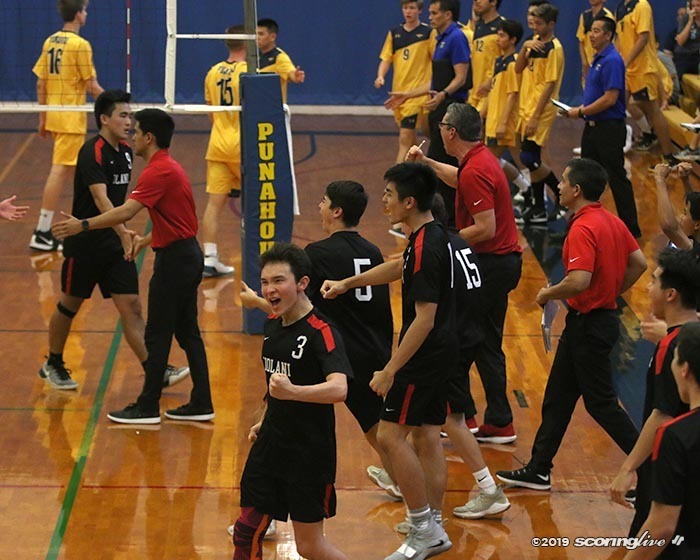 "We're going to keep building the program and get more players and hopefully be successful at some point," said Crusaders coach Rick Sandry. 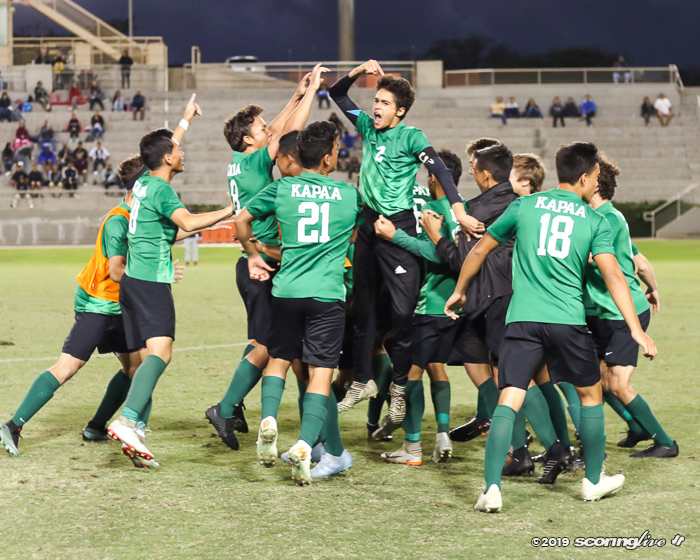 "Our school and soccer is not a Division I program yet. 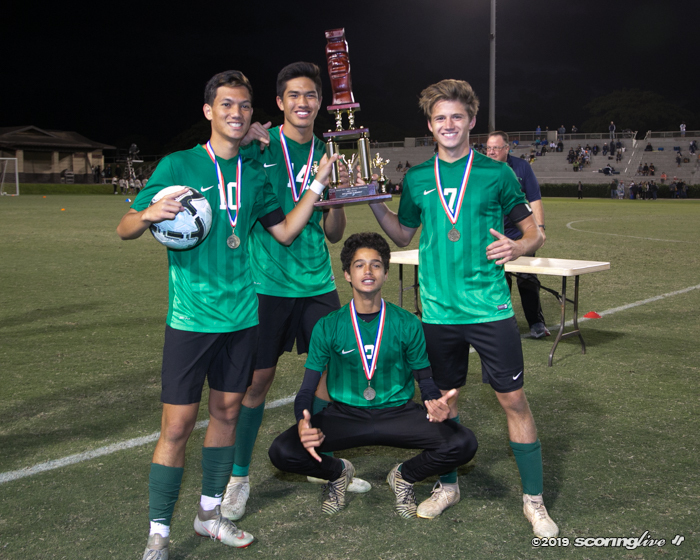 As you can see, we have more than capable D1 players but just not a D1 program yet. 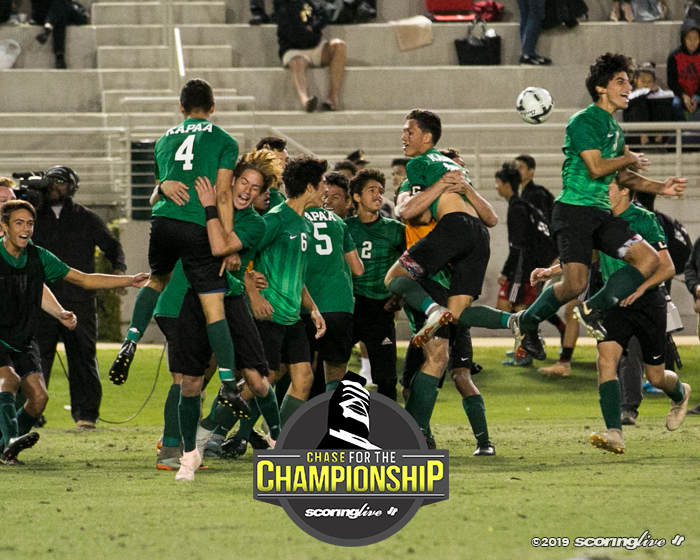 Last year we didn't make it but this year we were fortunate enough to get into it this year. 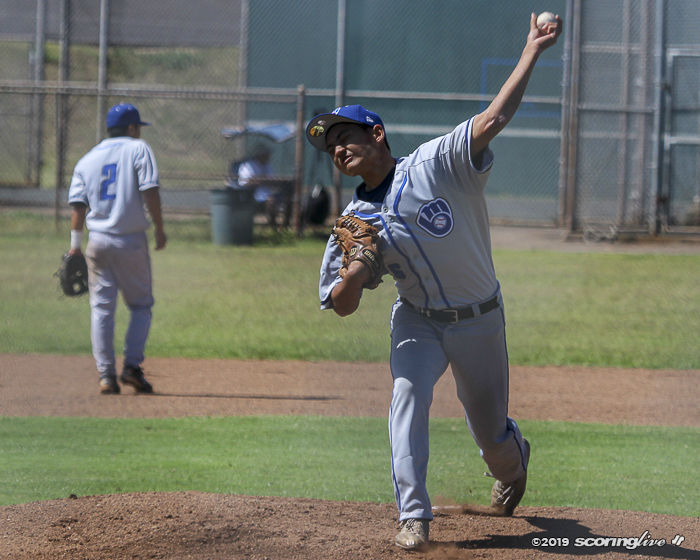 You got to tip your hat to Kapaa." 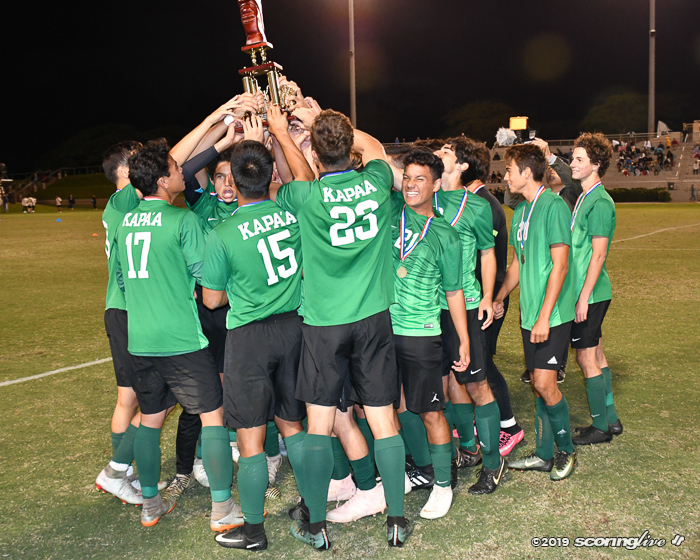 Tonight's title was a much needed win for the Kapaa Warriors after coming close in a couple of sports over the years. 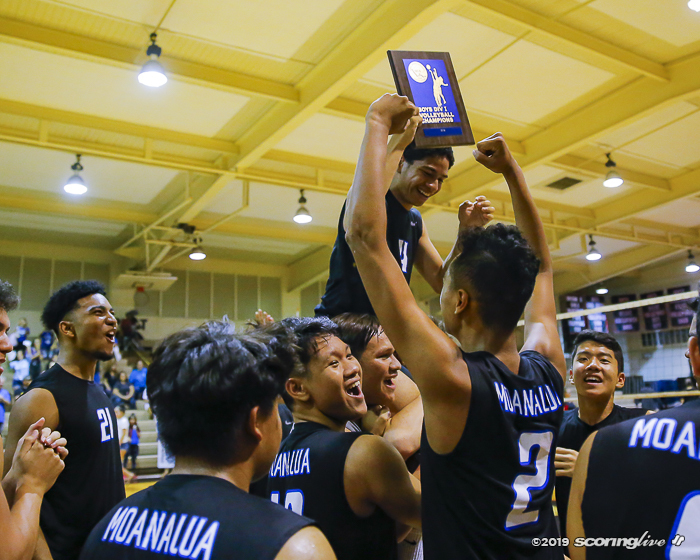 Costa, a member of the boys volleyball team, lost to Saint Francis in the Division II state championship last year. 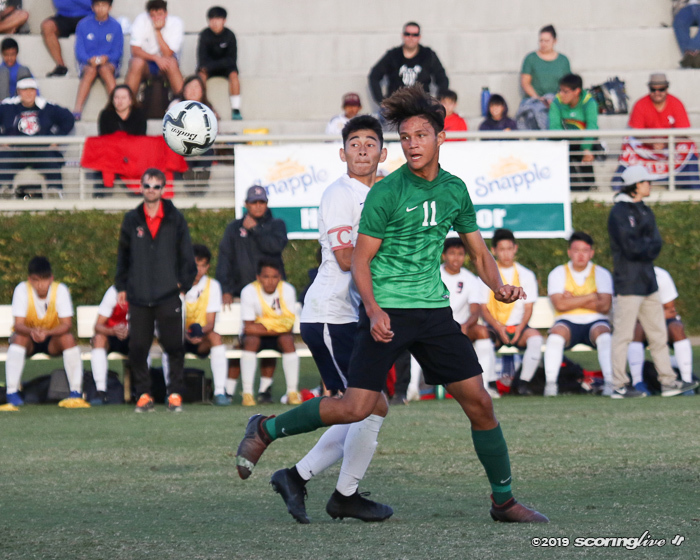 As a sophomore, he was on the football team that lost to Lahainaluna in the state title game in 2016. 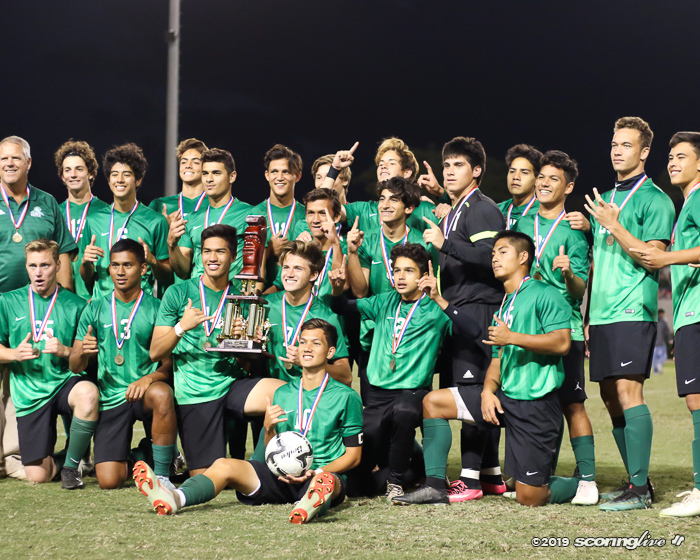 "I've been to four championship games and we've been very close," Costa said. 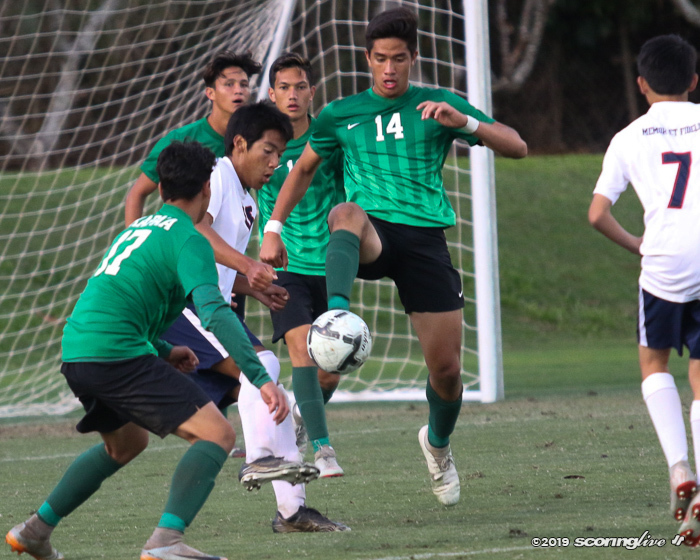 "We've had our football team come very close this year too. 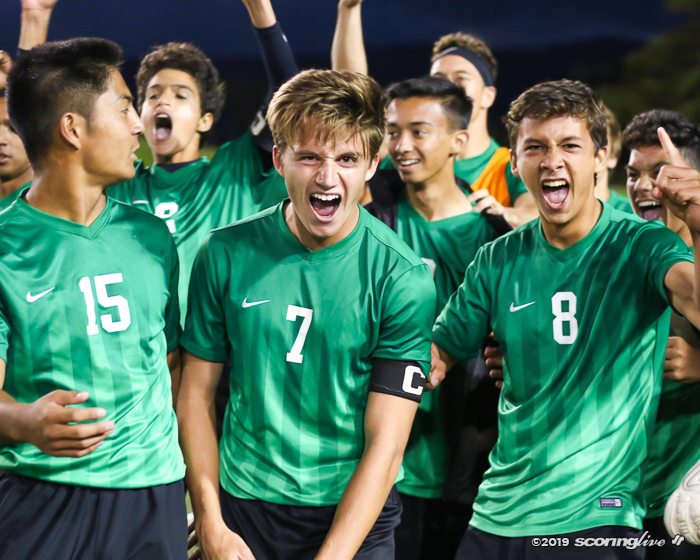 We've got some of them on this team and they came in fighting and we wanted this one."